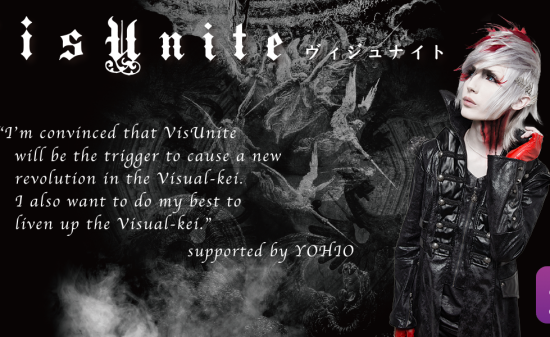 after the release, and newly took the V-kei scene by storm. 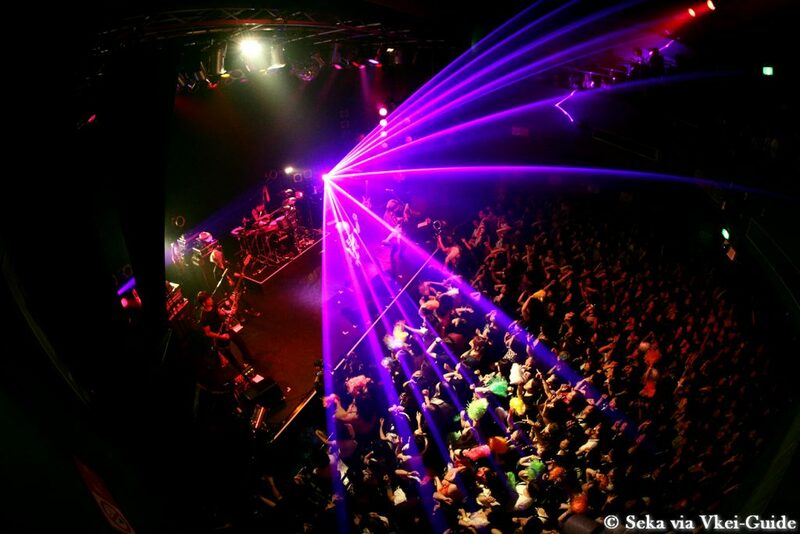 When the venue darkened, several clocks were displayed on the screen. 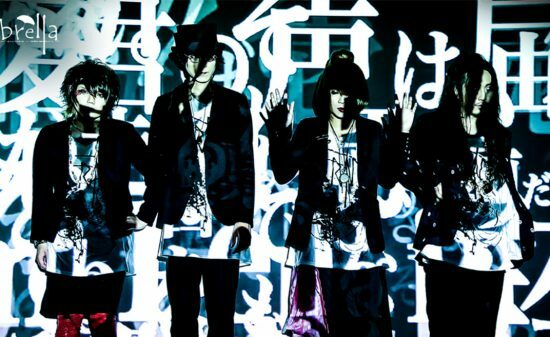 Time passed on the screen as if following the past, and the four bands’ pictures were projected. 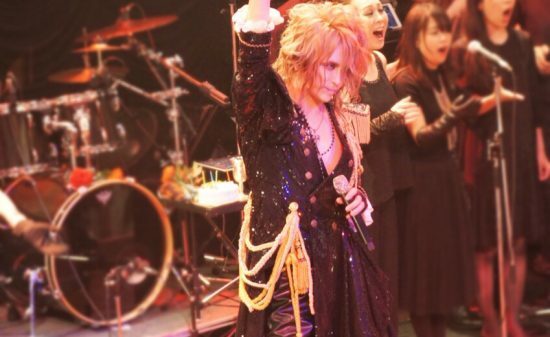 Suddenly, a whistle rang, and LAID appeared on the stage to up-tempo opening music. 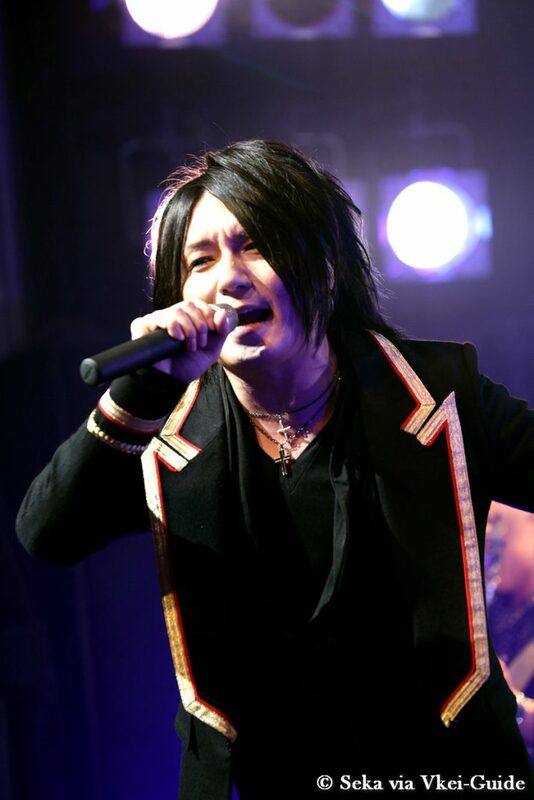 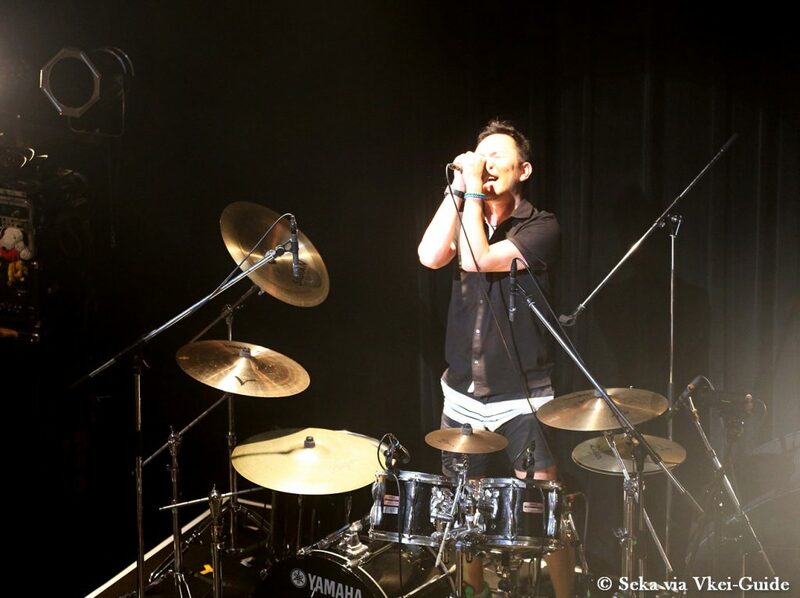 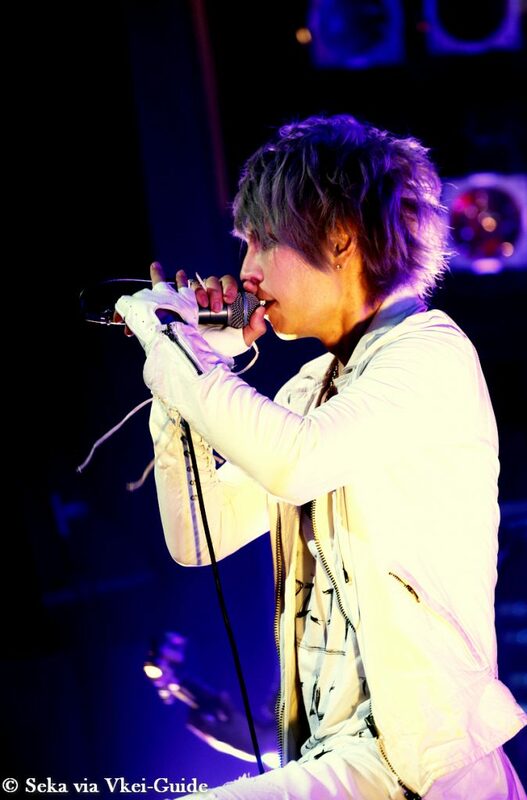 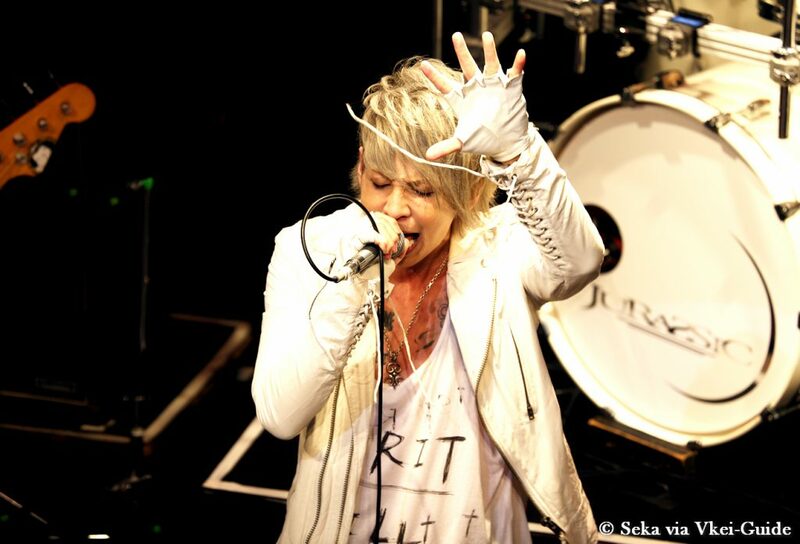 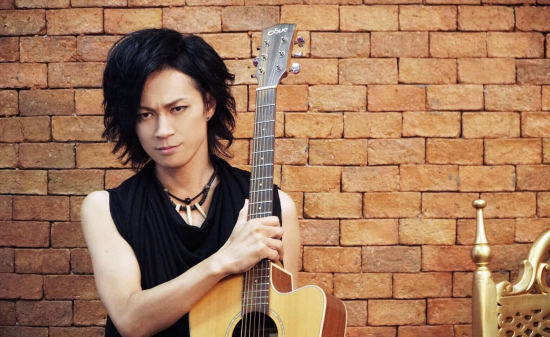 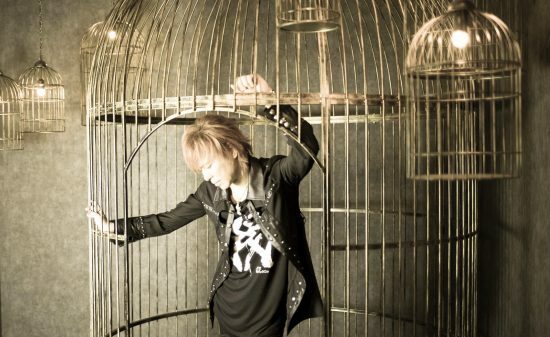 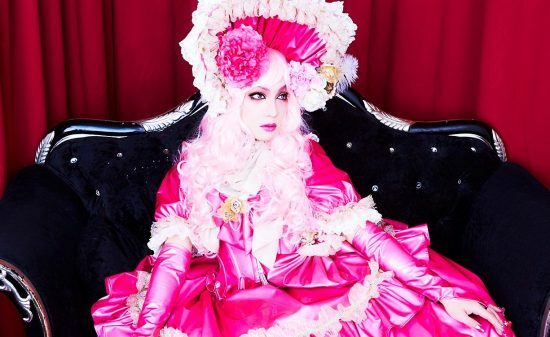 The vocalist RYO is still active in KING, and he attracts the fans with his soulful vocals. 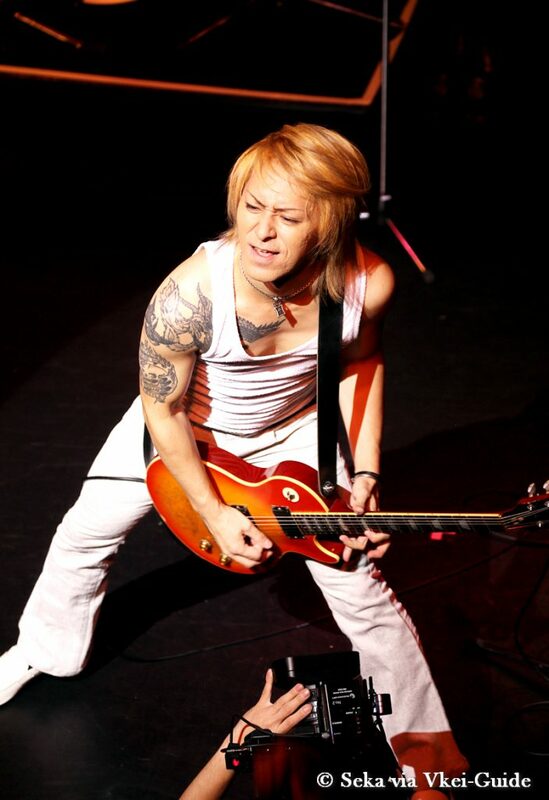 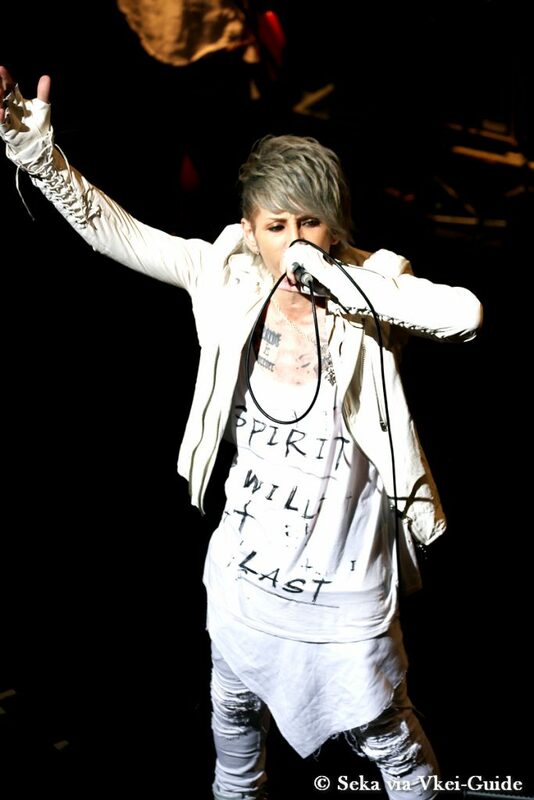 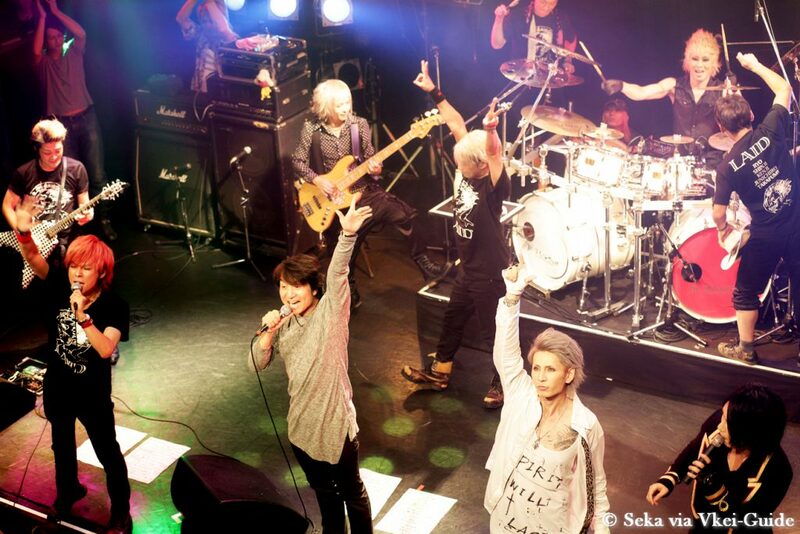 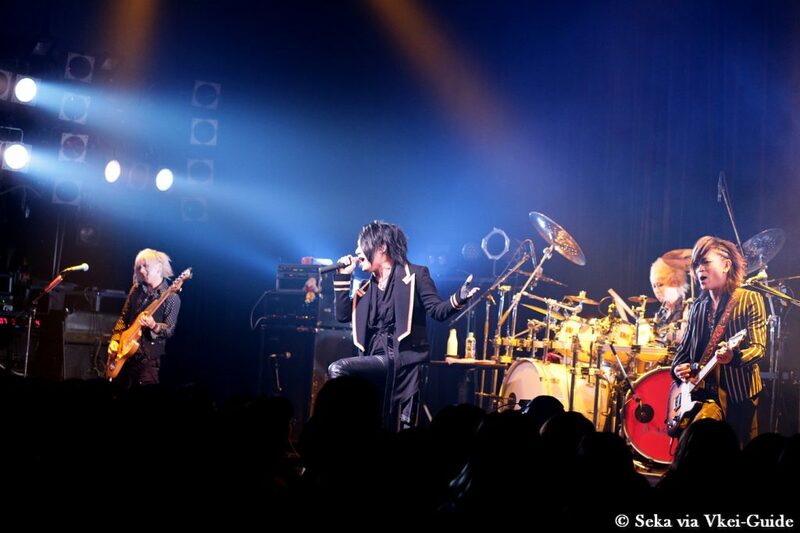 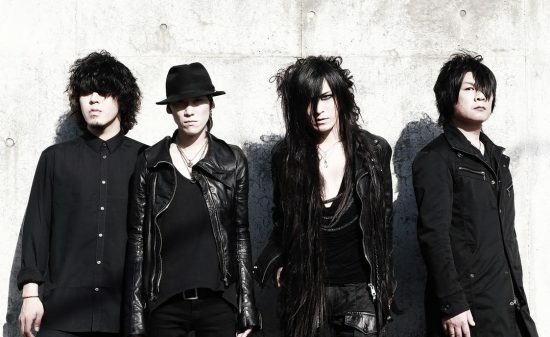 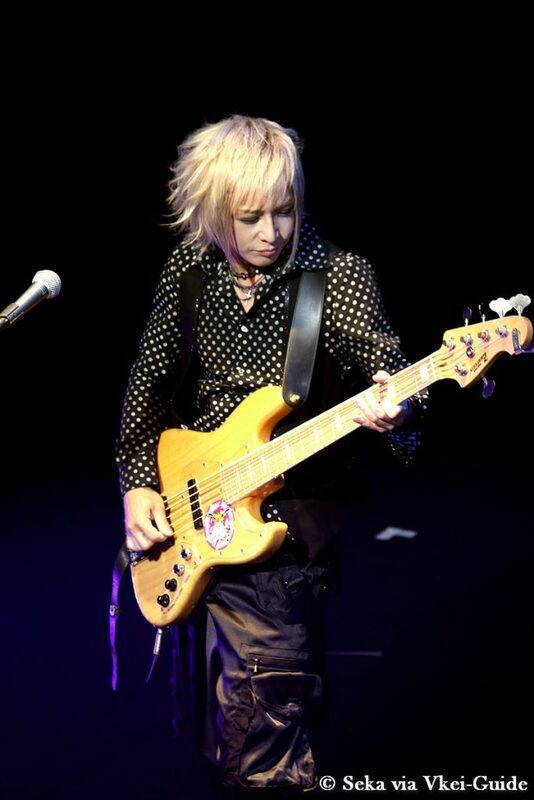 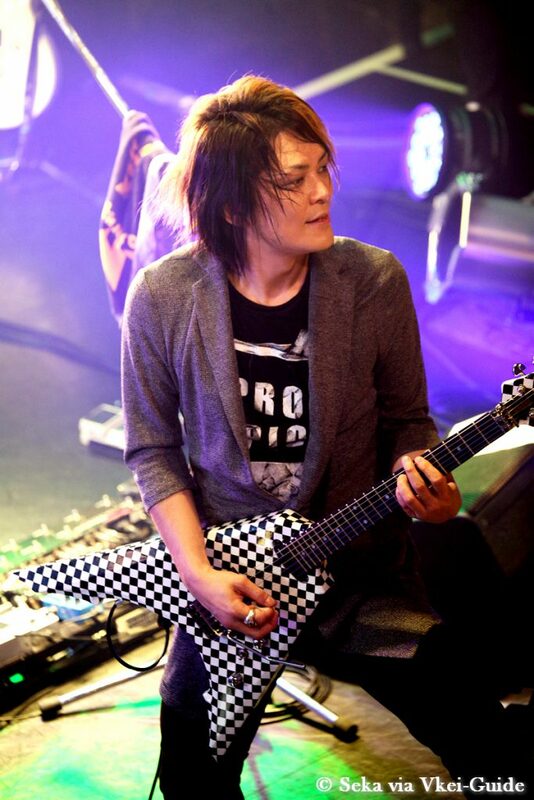 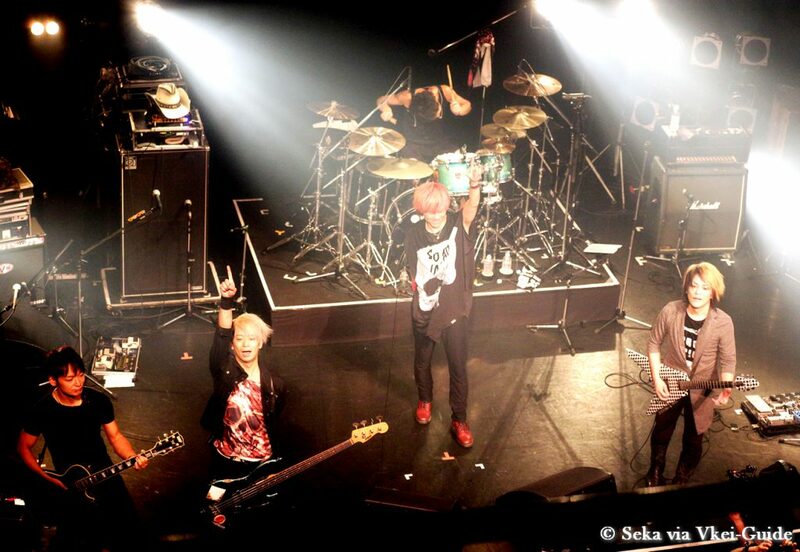 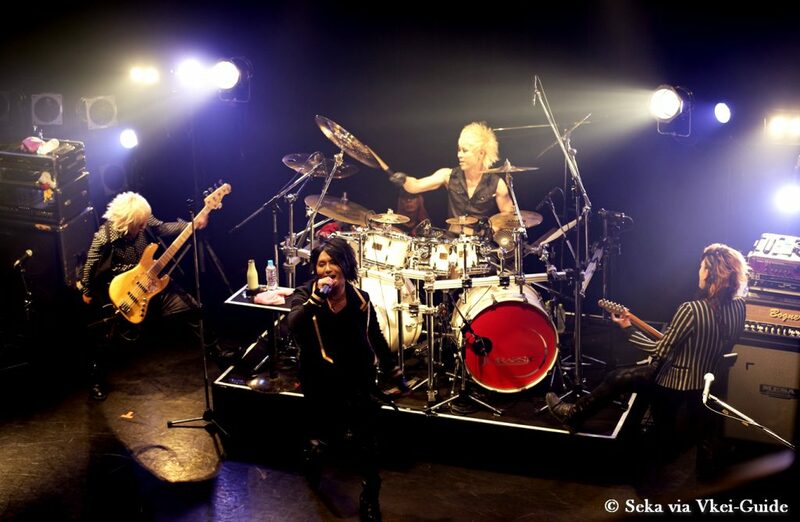 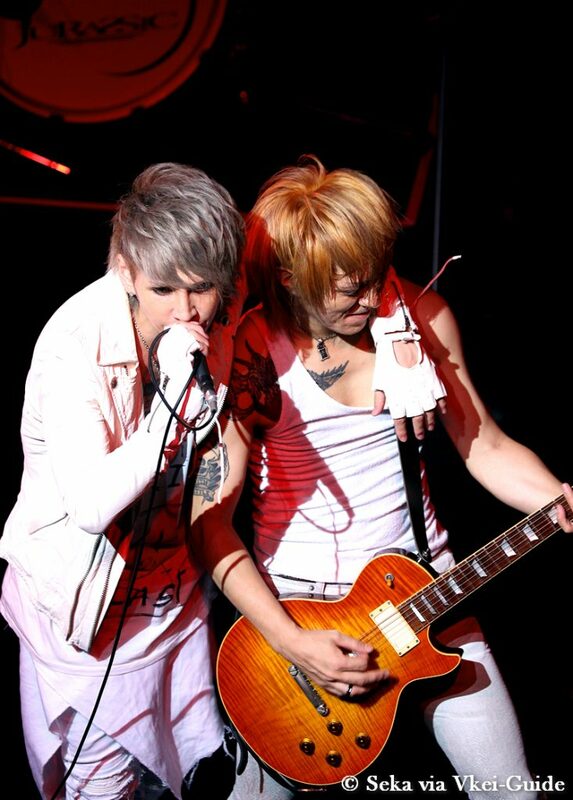 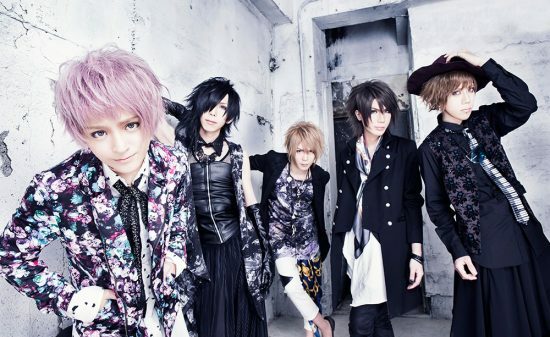 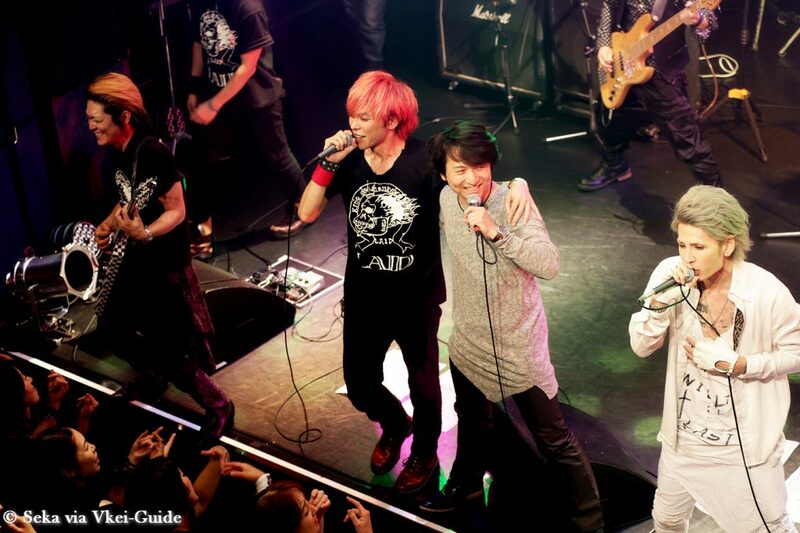 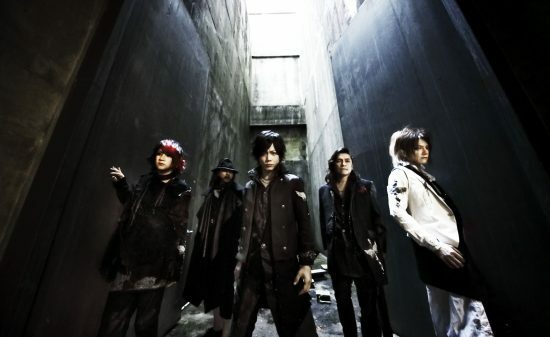 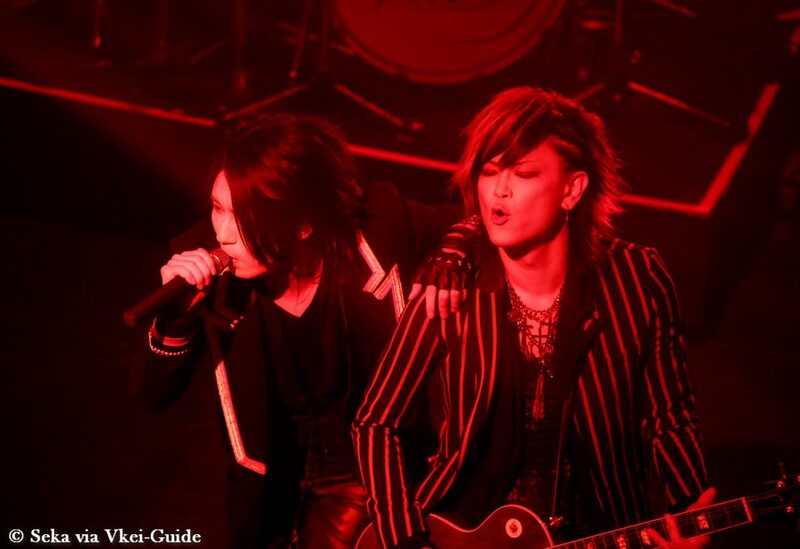 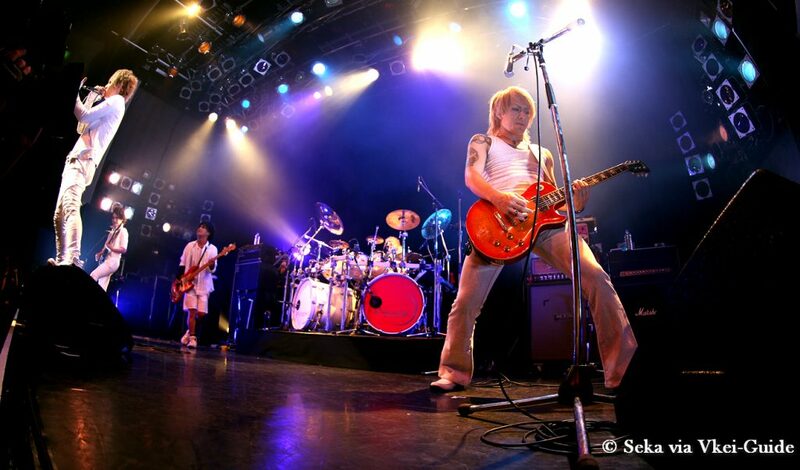 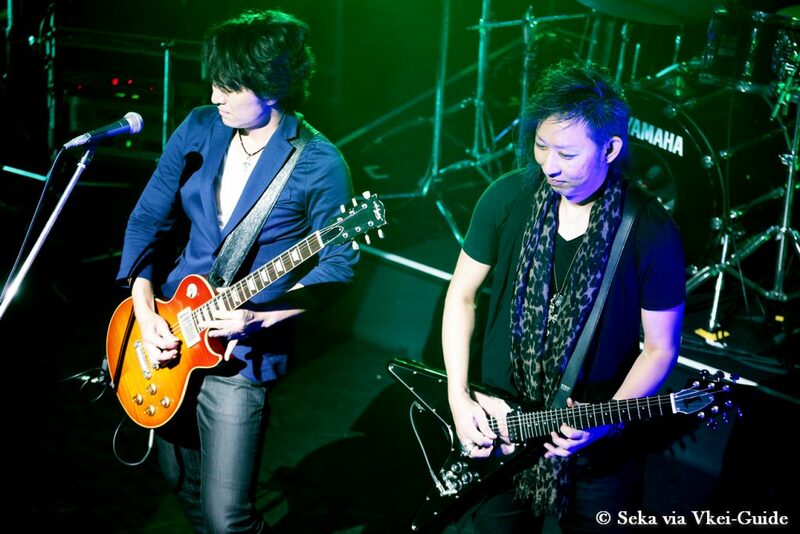 The first song by LAID, the members getting back together after a long interval, was a rock tune, “Kimi Shidai”. 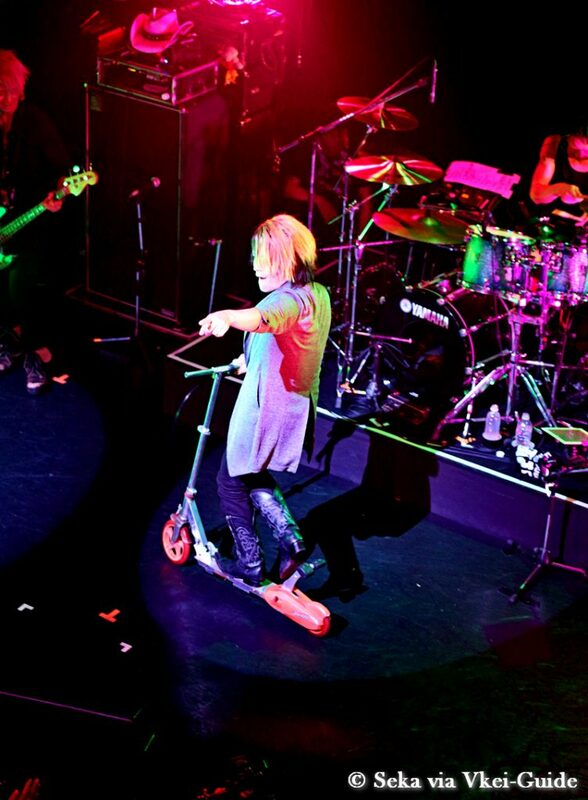 Silver tape flew over the crowd in the intro, and that heated the audience up more. 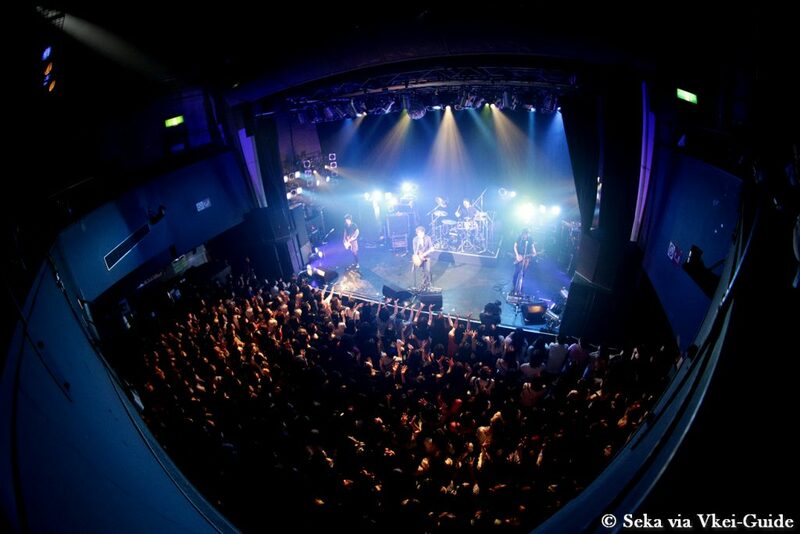 “Get excited! 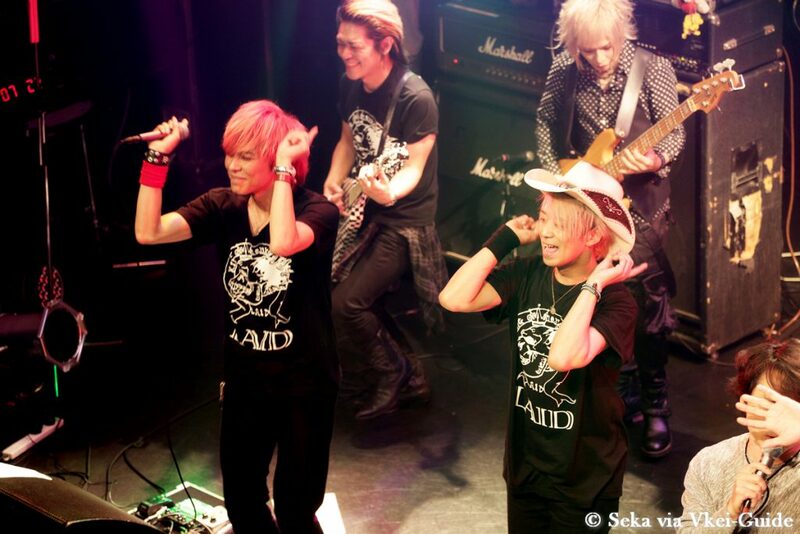 We are LAID!” RYO shouted with a smile, and he looked happier than anyone. 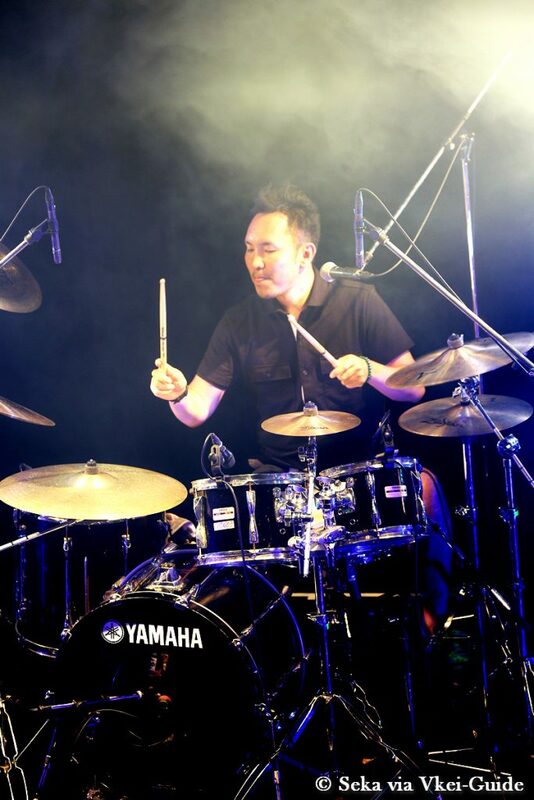 In “yes,” which was a catchy dance tune, TAKAFUMI’s drumming rushed powerfully, and KENJI and SHINJI created fine and delicate sounds. 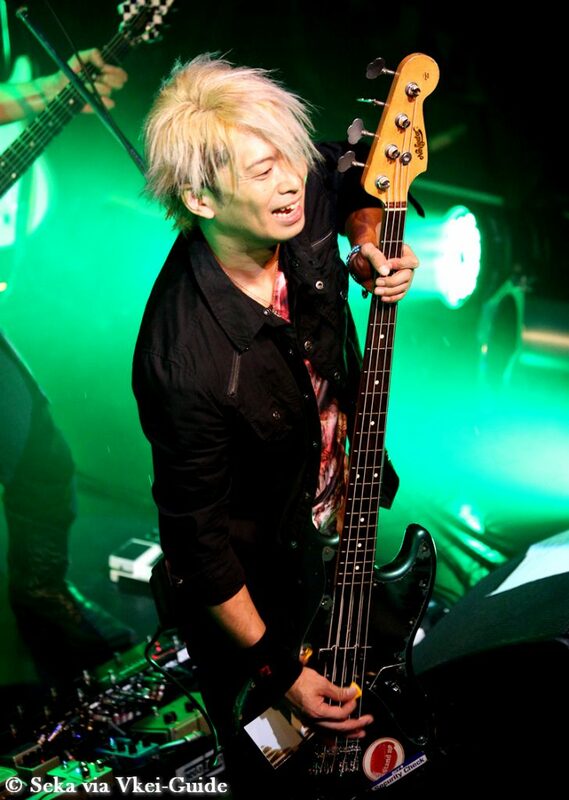 The bassist JUNICHIRO brought additional excitement to the dance number by swaying his hips playfully. 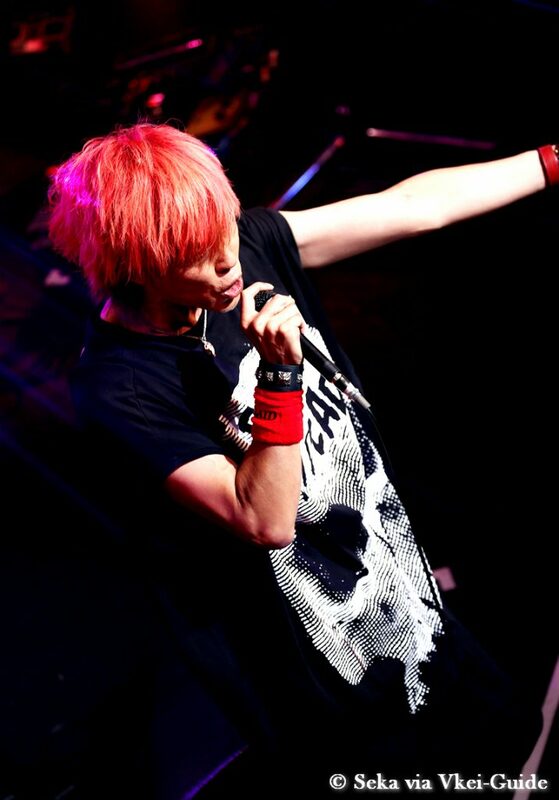 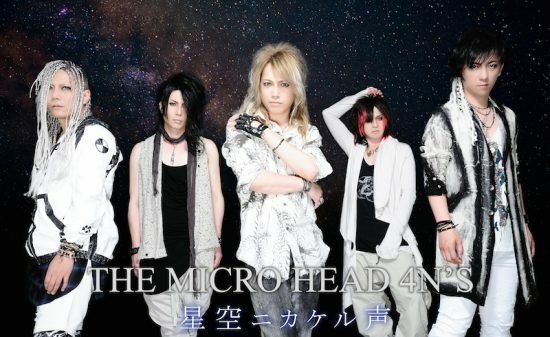 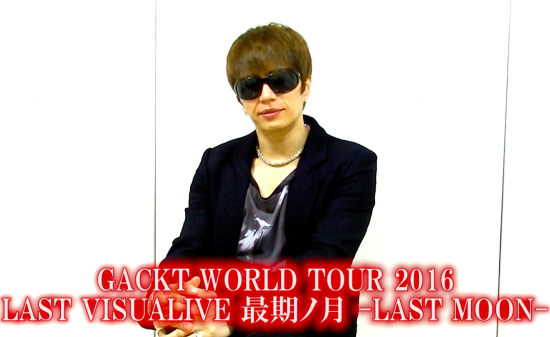 In the emcee, RYO expressed, “The members are a little mixed up, but we are LAID! 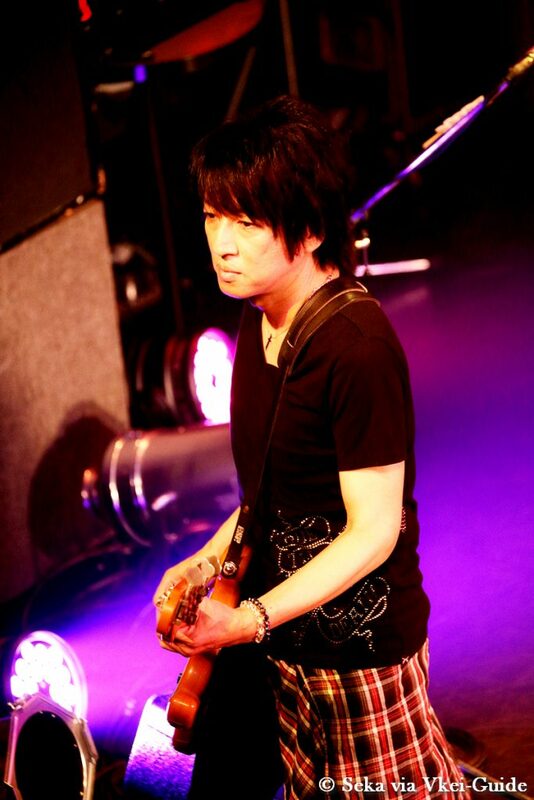 How much I can show off for the first time in 15 years… Yes, I didn’t talk so much before. 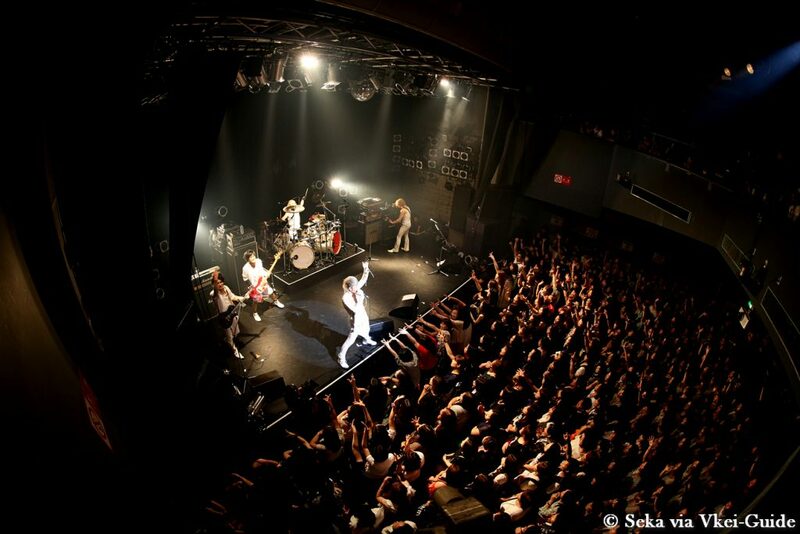 15 years ago I got cheers just by opening my arms like this.” The fans enjoyed the nostalgic choreography in “love & desire”. 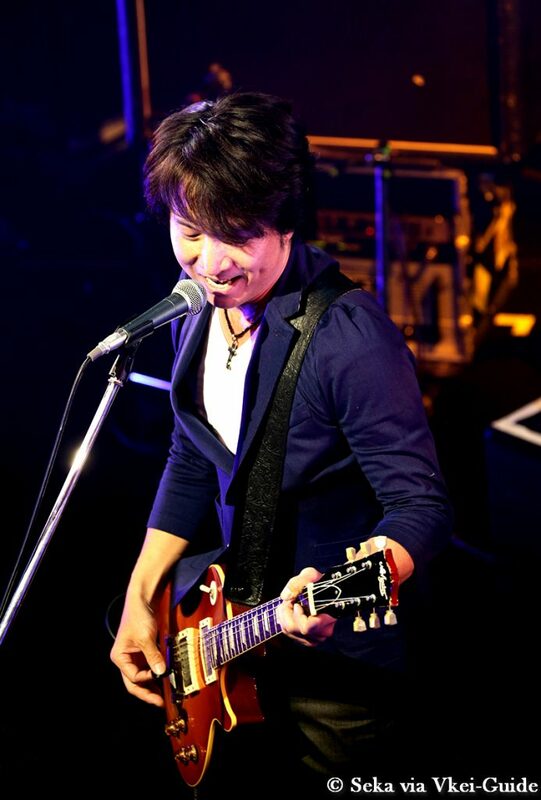 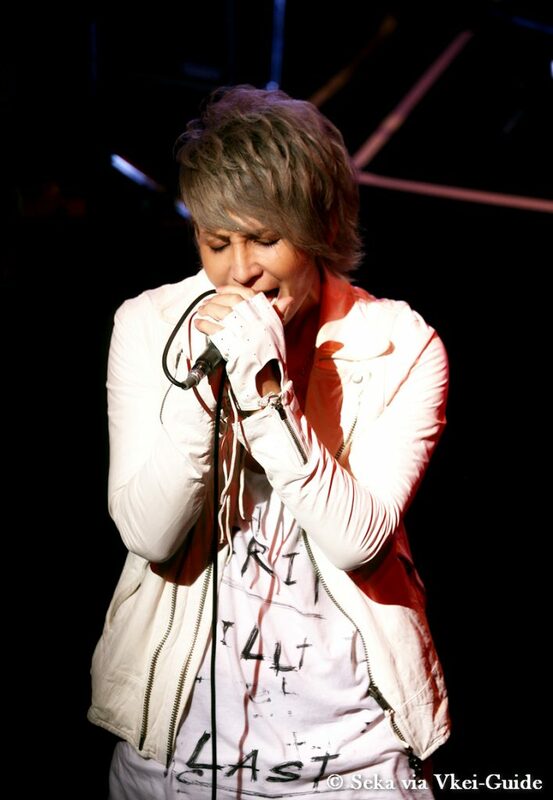 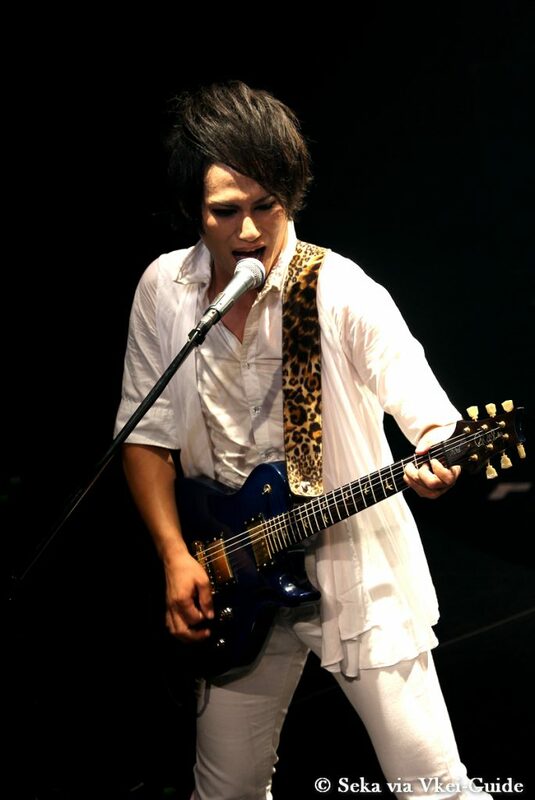 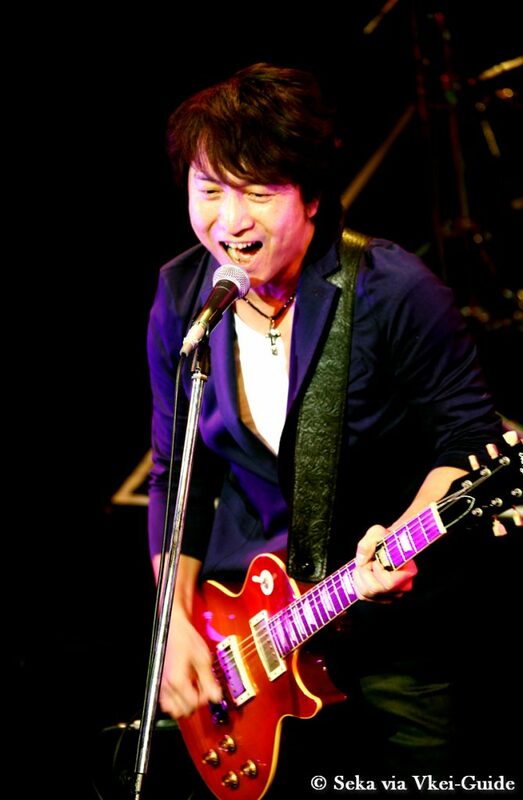 RYO’s soulful voice was delivered to the audience in “Hoshi ni Negai wo”, which had a sweet melody. 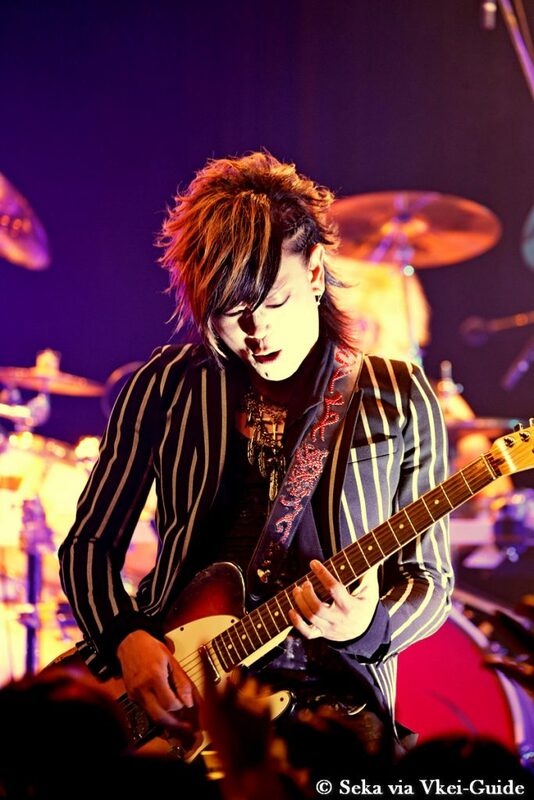 In the last song, “LIKE A MONKEY”, the vigorous guitar sounds excited the fans more. 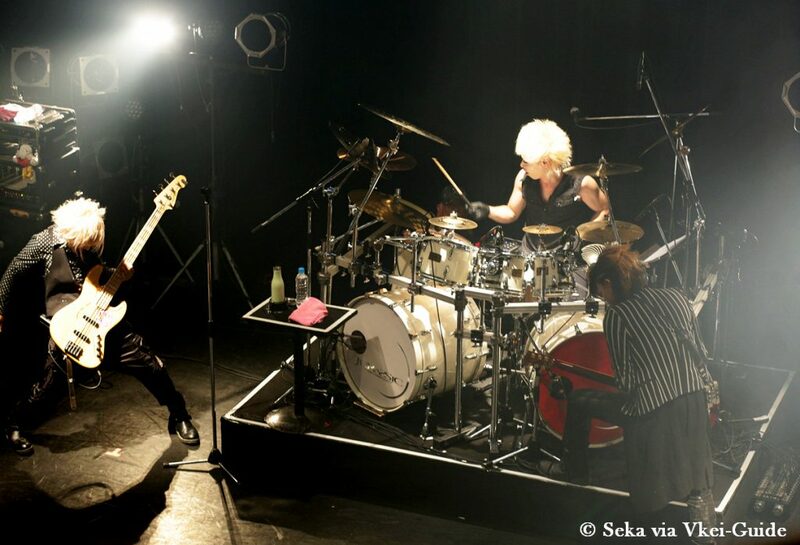 The experienced members had the leeway to enjoy playing even though they were playing the songs for the first time in years. 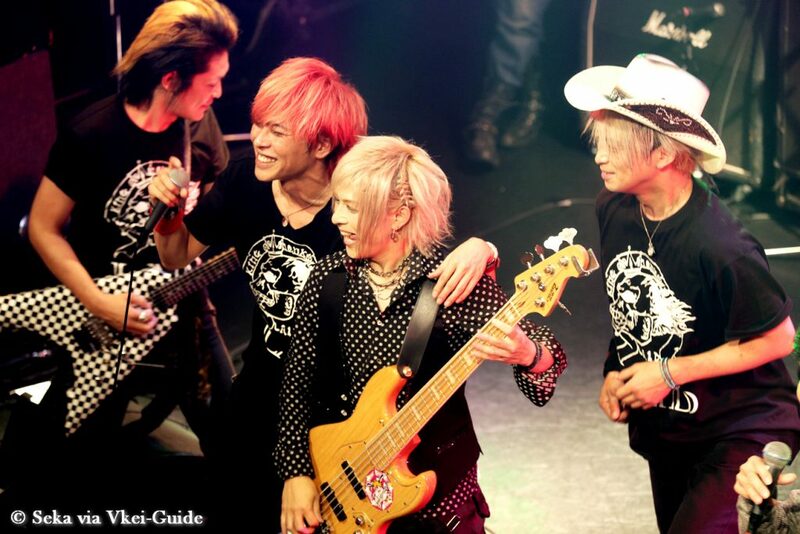 Their feelings were transmitted over the hour that the members enjoyed performing as LAID with all their hearts. 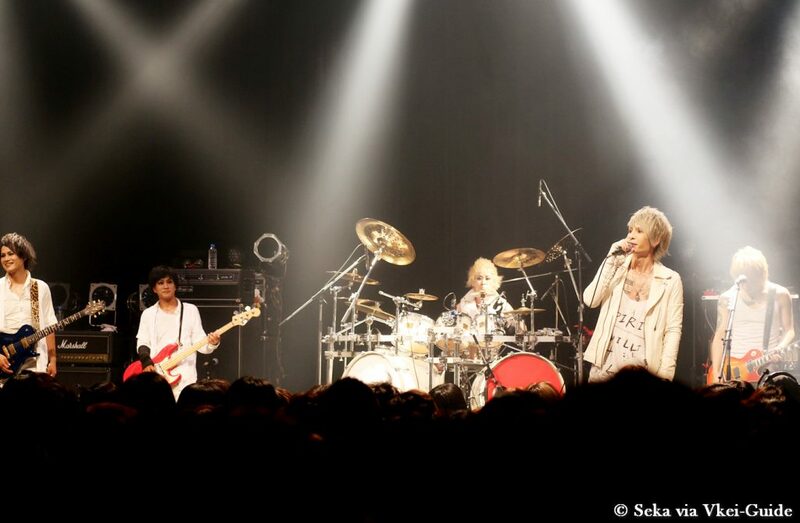 ILLUMINA, marking their 20th anniversary, was the second act. 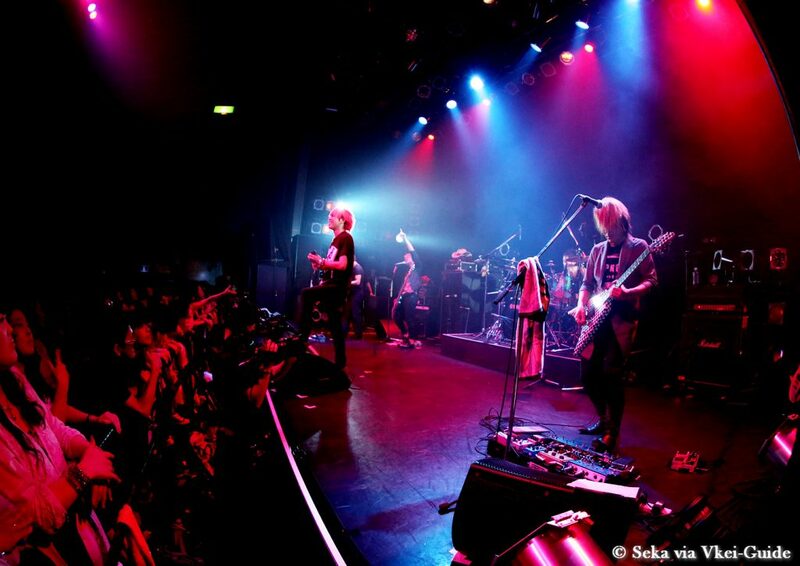 The members came onstage to a big cheer, illuminated by the blue lights, and “Style & Soul” started quickly. 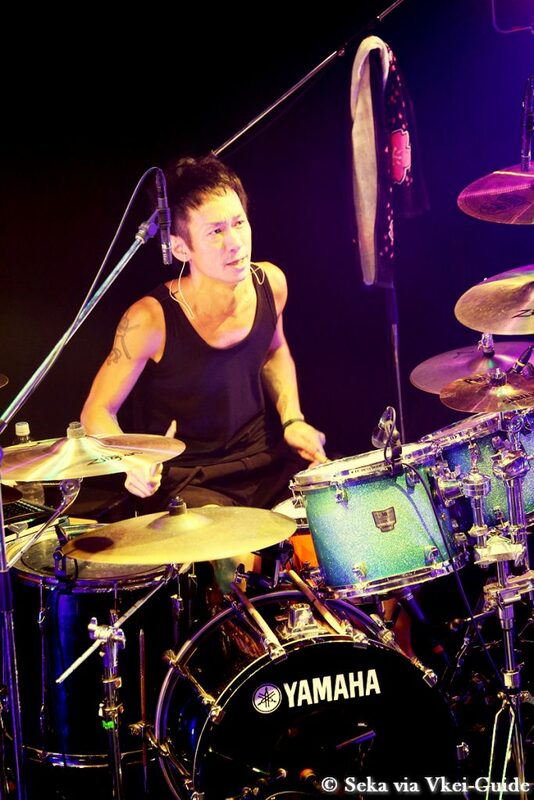 SATOM created the rhythm with bass-drums and cymbals quickly matching the distorted deep bass made by the bassist TAKA. 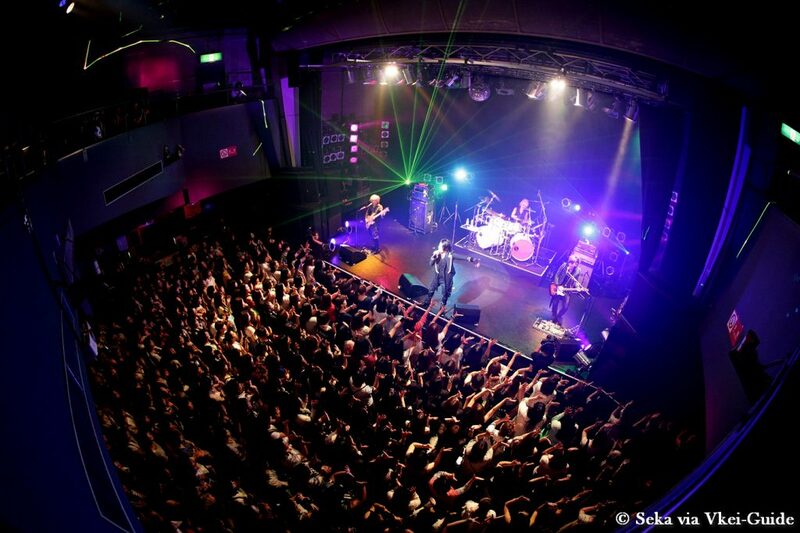 NAO, the vocalist and guitarist, delivered the powerful vocals, playing the guitar and dancing. 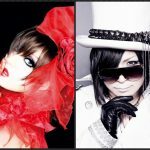 In “Wasurenaide”, the bittersweet guitar melody from NAO and TAR in harmony was impressive, and NAO’s vocals soared in the sweet melody. 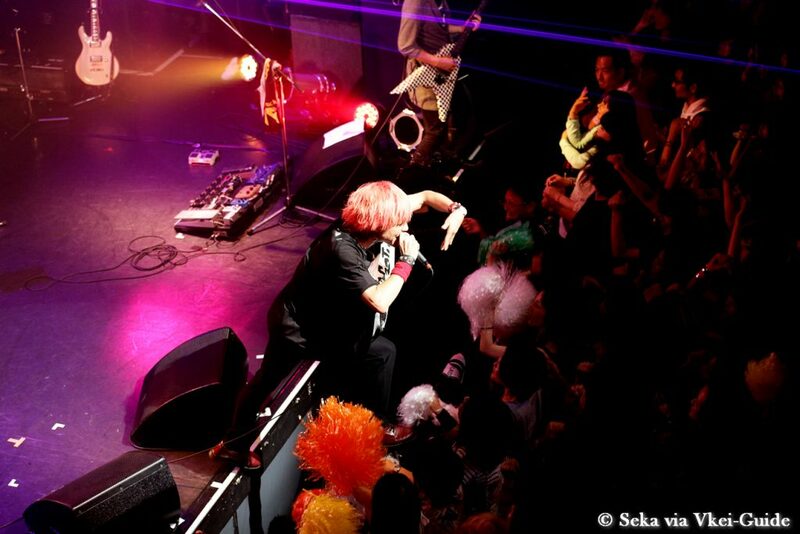 In the emcee, NAO praised, “Wow, you all got tickets. 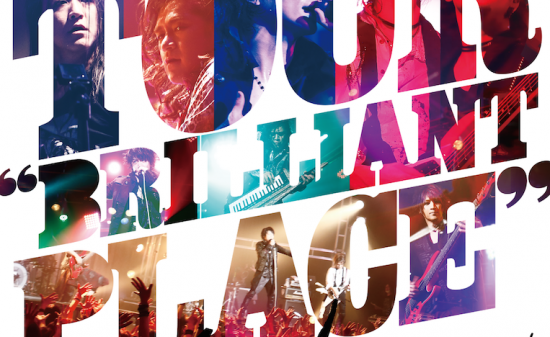 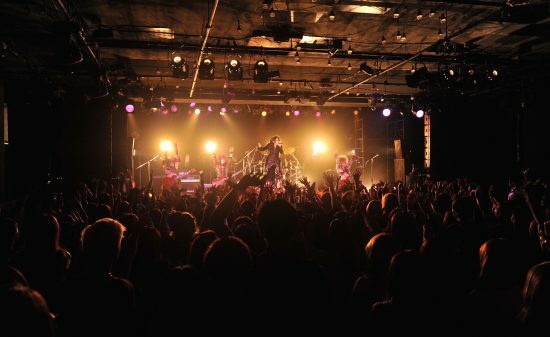 They’re premium tickets!” Then, NAO expressed his passion for this show, “We are talking about the old days backstage. 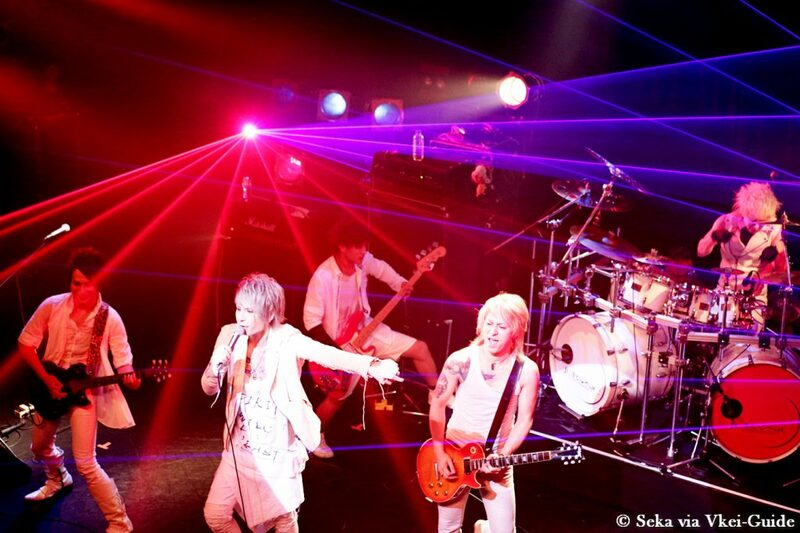 ILLUMINA marked our 20th anniversary last year. 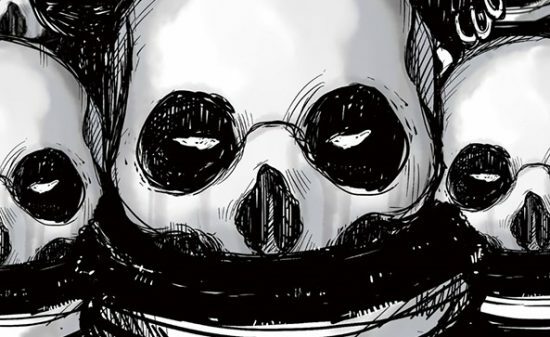 We have motivation, and we have never been so happy. 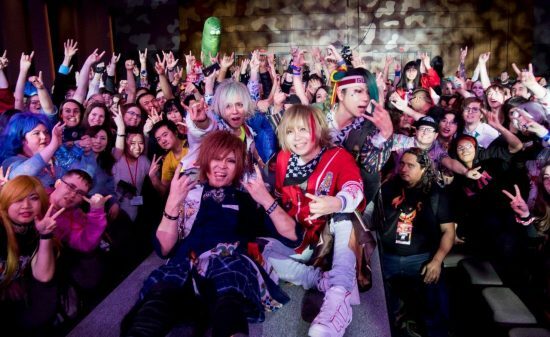 I don’t even have words to express it.” The big cheers from the audience arose when they heard the title of the next song, “Love Sick”. 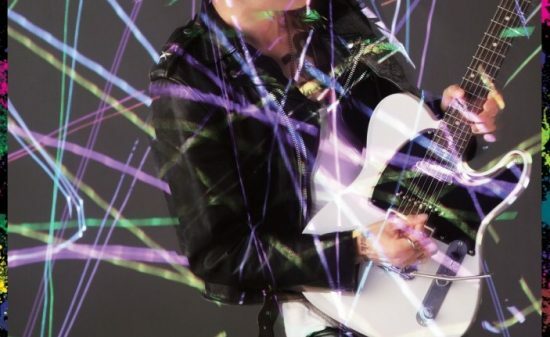 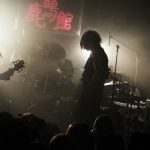 The ear-breaking guitar sounds from TAR echoed on the floor, and also, the fans made hearts with their hands and sent them to the members again and again for the chorus as if the song itself was a call and response. 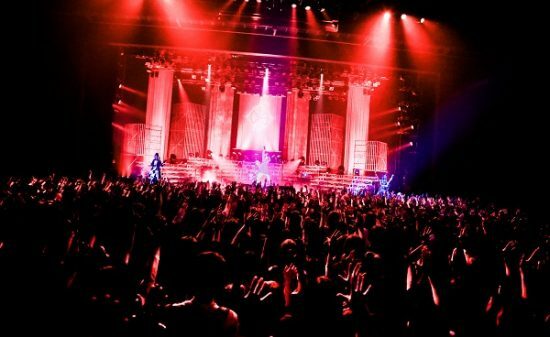 It was clear that the song was very enjoyable for both the members and the fans. 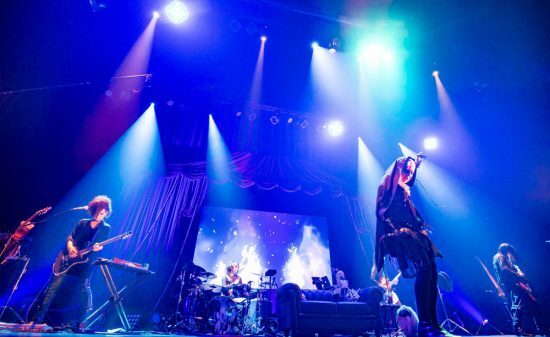 Lastly, NAO said, “We would like to end the show today with this song.” Before “maybe tomorrow,” the pop, catchy guitar riffs of which remained in the audience’s hearts, started. 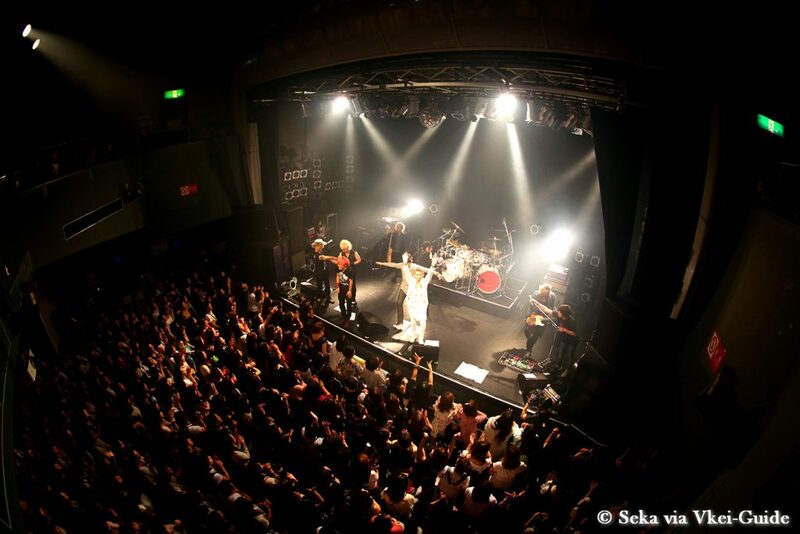 NAO and the fans showed they desired each other by reaching their hands out for the last song, given full-heartedly. 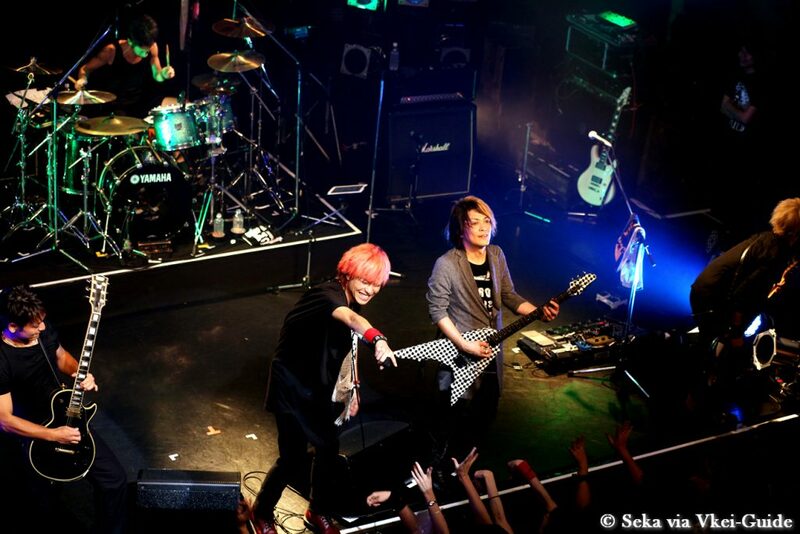 Next band was JURASSIC. 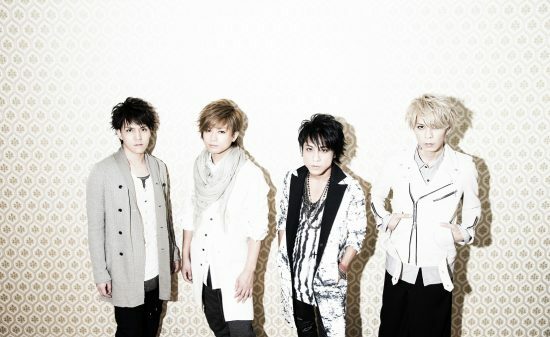 They were formed on 1998 at Nagasaki,Japan which is member’s home town. 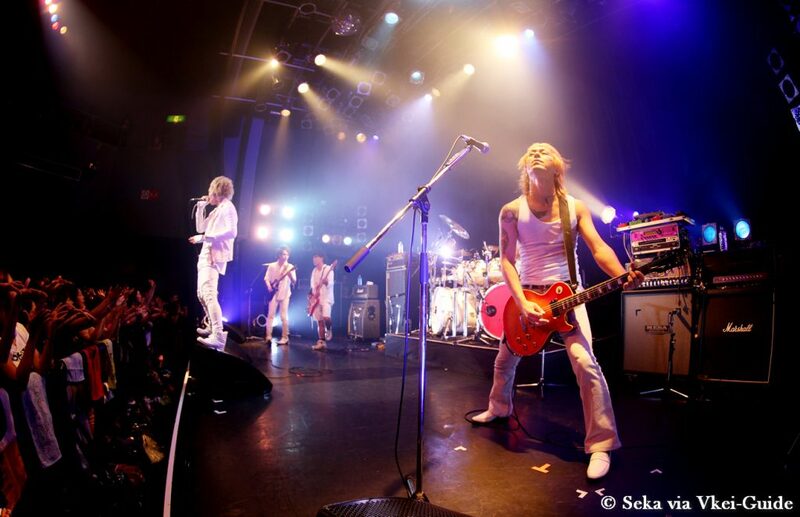 Since the beginning all the members were wearing brightful white costumes. 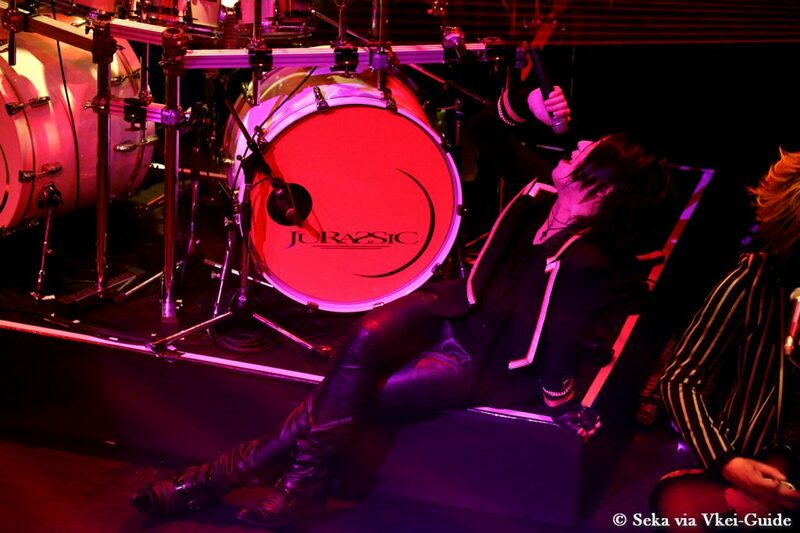 JURASSIC took the Visual-kei scene at the opposite movement, because at this moment the standard of this industry were dictated by black stuff. 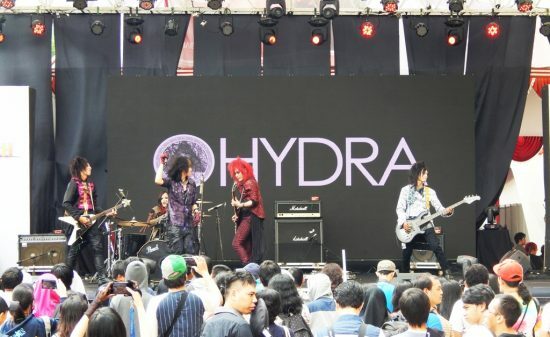 Their particular sound; with a rapid and loud rythm attracted many people with their amazing liveshow’s performance. 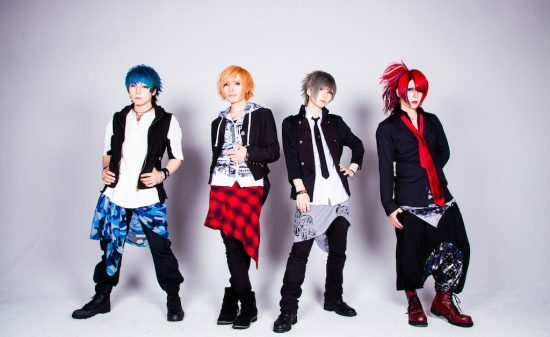 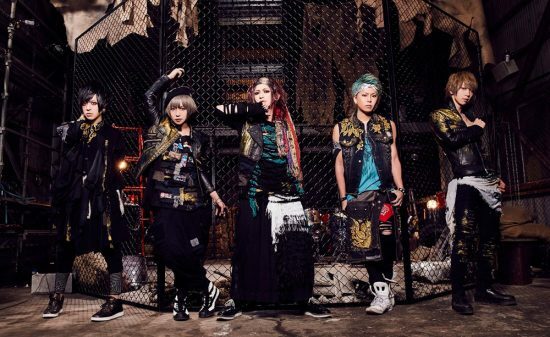 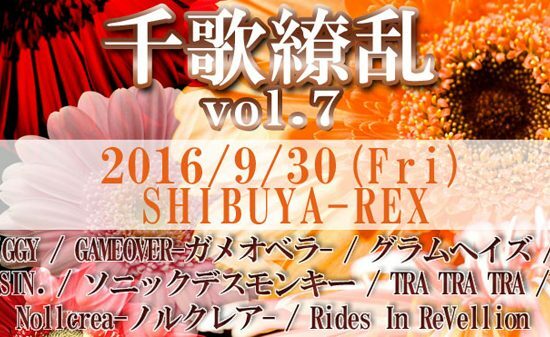 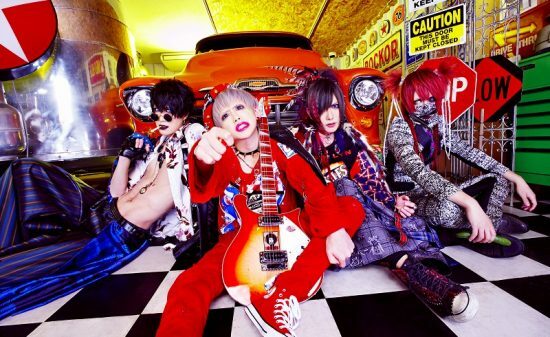 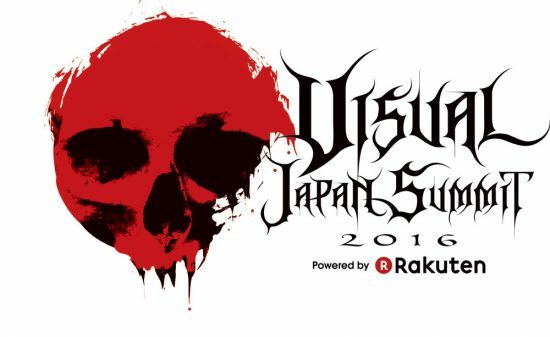 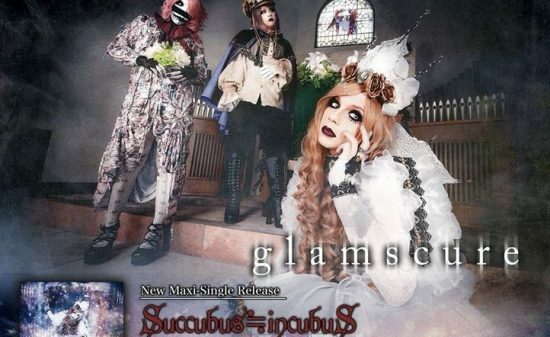 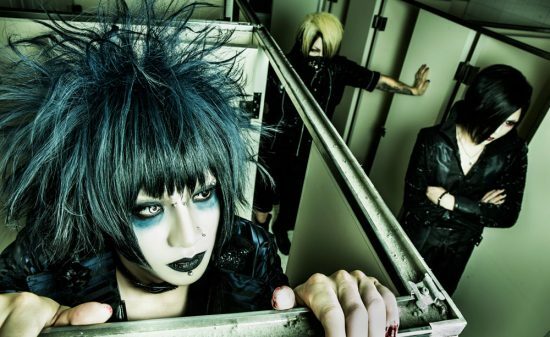 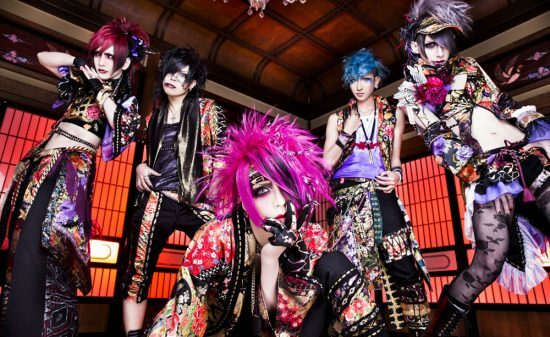 Even now, JURASSIC are very famous as “The Visual-kei band from Nagasaki”. 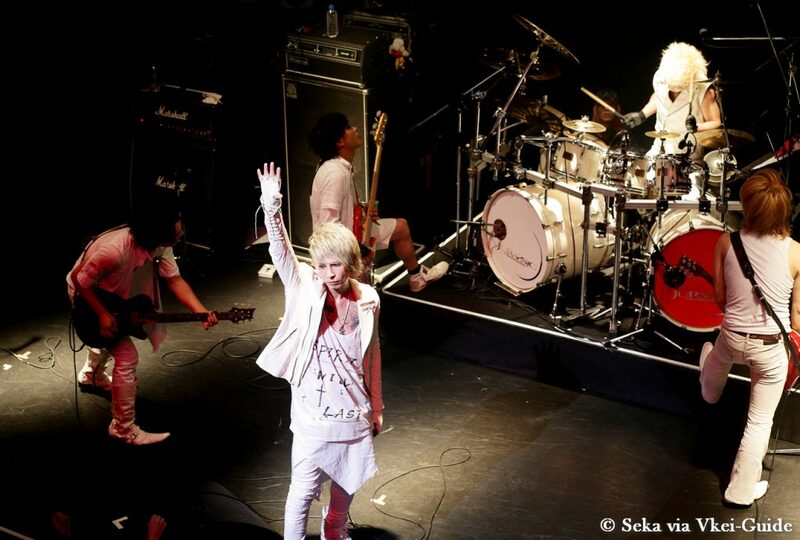 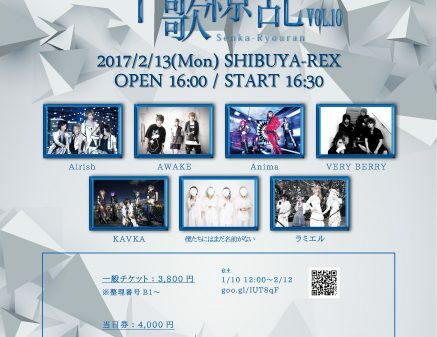 All member came up on stage,wearing all white costumes as expected, and Vocalist YUKI took his place at the center slowly and put his left hand up. 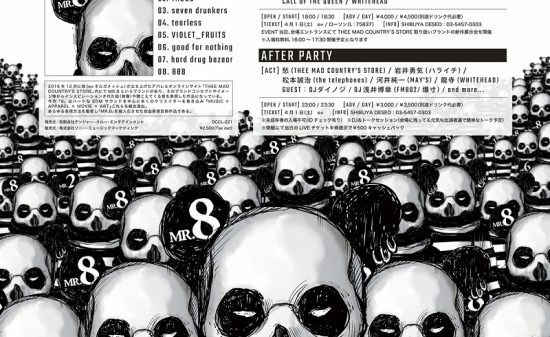 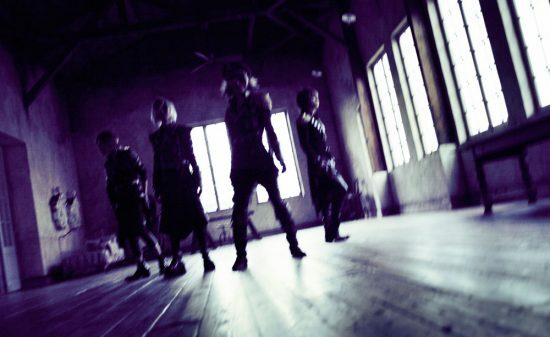 “one or eight” started and the same time, the sounds producted by the 4 musicians(2 guitars,bass and drums) went along all together beautifully, and YUKI’s voice perfectly fit on this music. 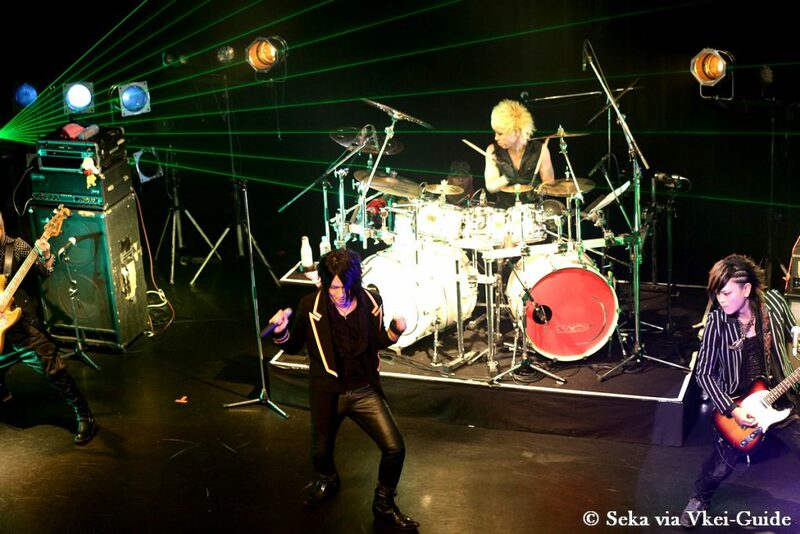 The stage’s lights were reflecting pretty colors on member’s white costumes. 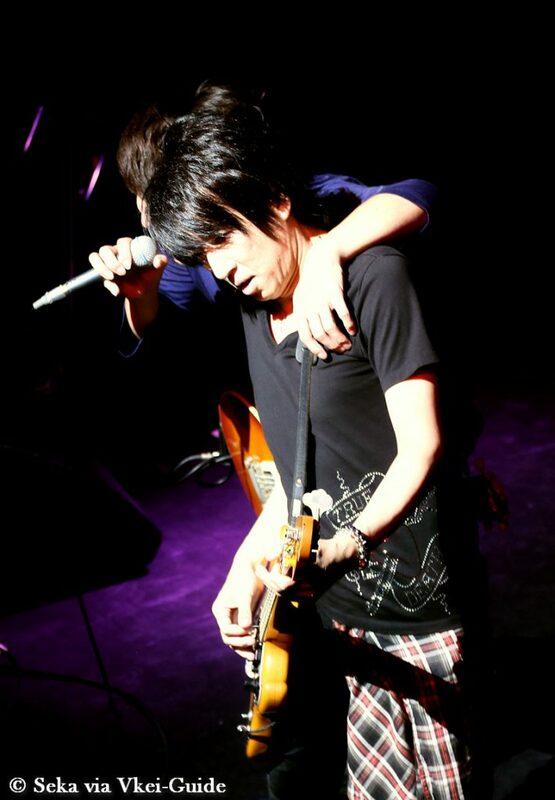 Guitarist SHU’s chorus overlap with them. 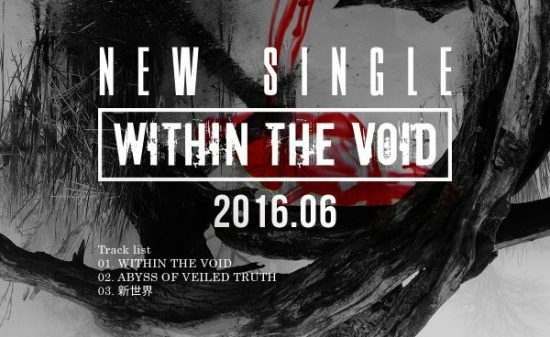 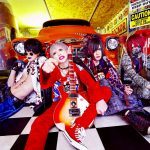 YUKI inflamed audience before “ZERO” was launched. 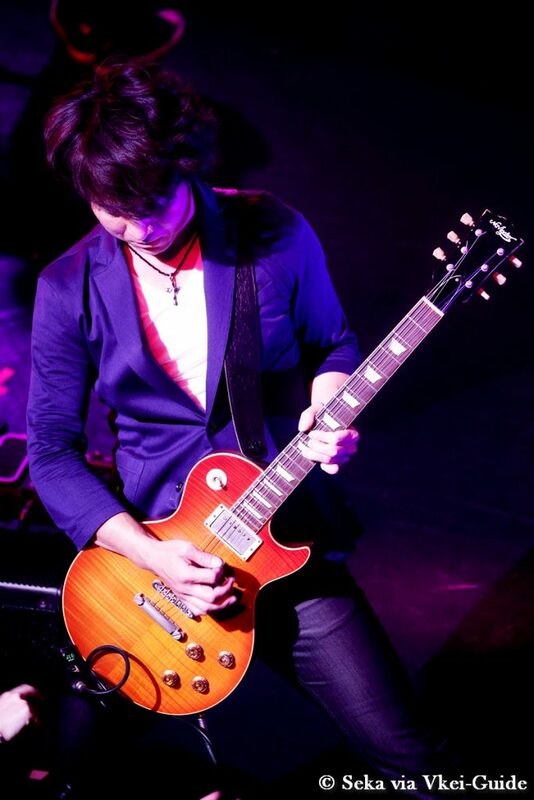 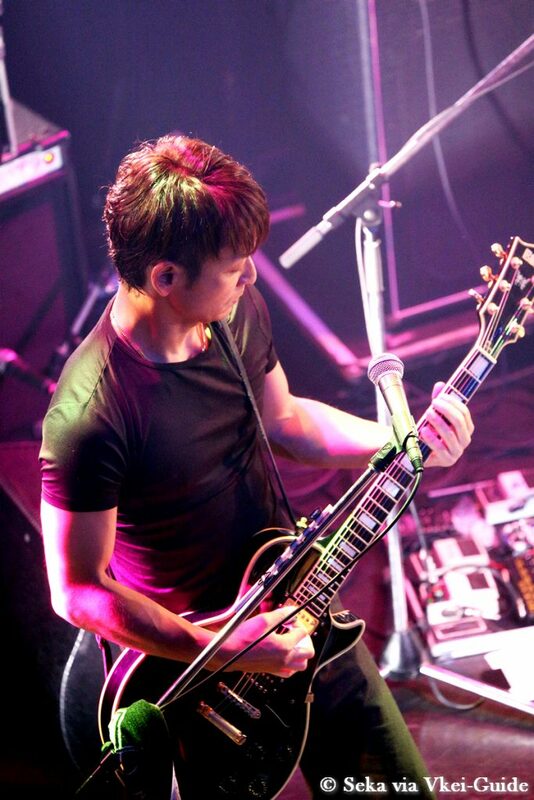 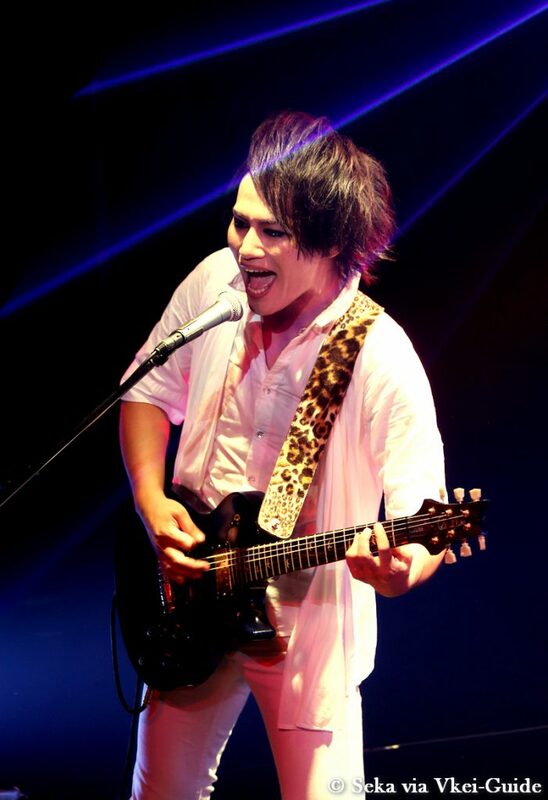 Guitarist KOSHIRO was impressive with his guitar play during his solo part. 「Cold Rain」 and the song that was created after the band’s reformation “Gattsuki masse!! 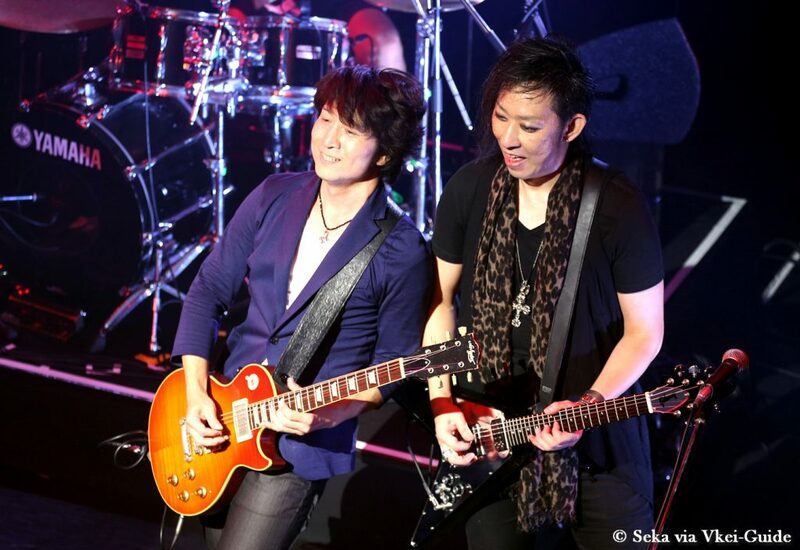 !” was played. 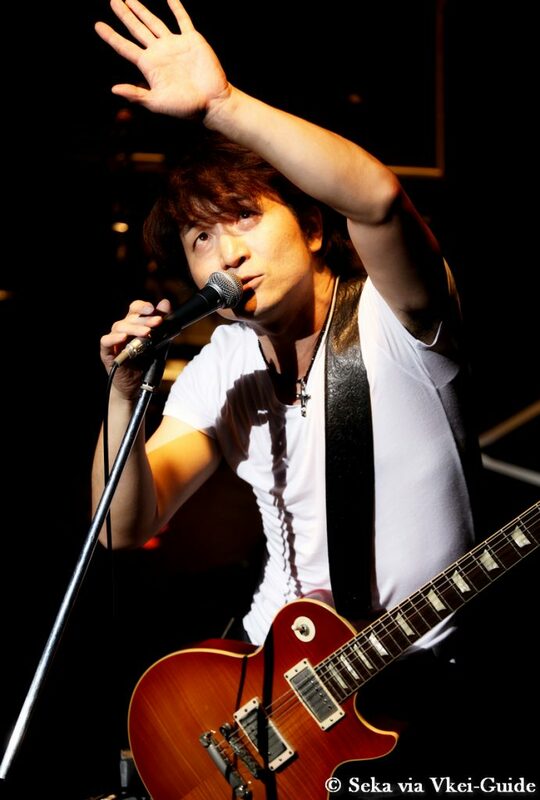 SHINGO’s play was very dynamic during “The brightest”. 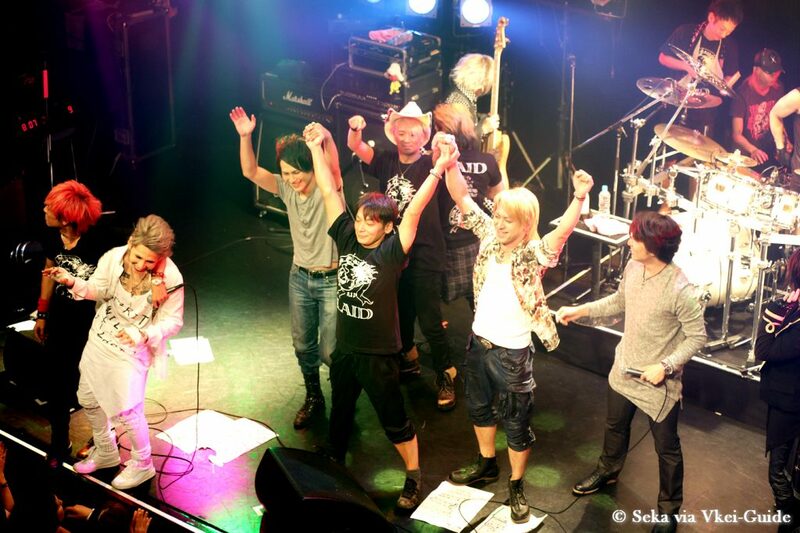 You could hear a lots of acclamations from men’s fans in the audience. 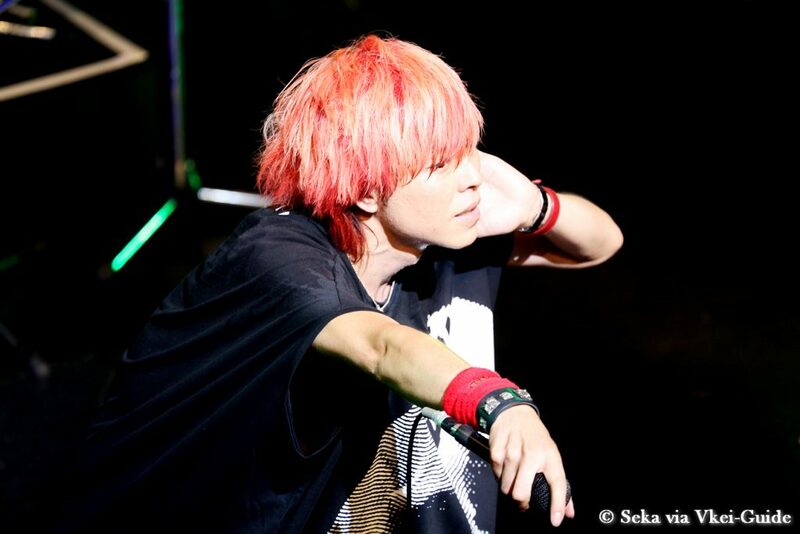 During the YUKI said 「I’m very glad that a lot of people had remember JURASSIC. 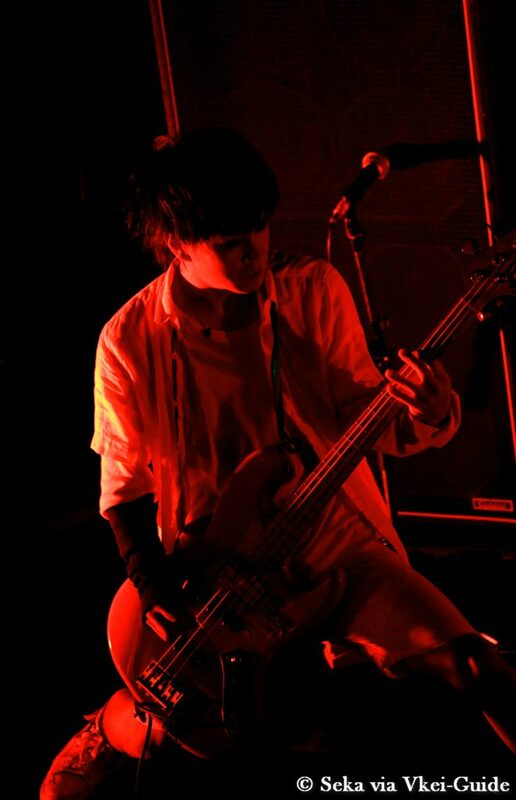 We had activities during only 7 years. 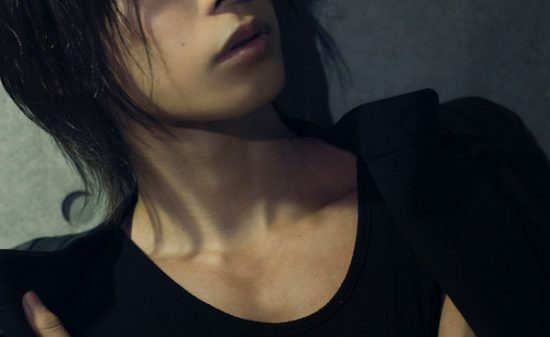 However it was not a waste of time.」 and he looked back on past days. 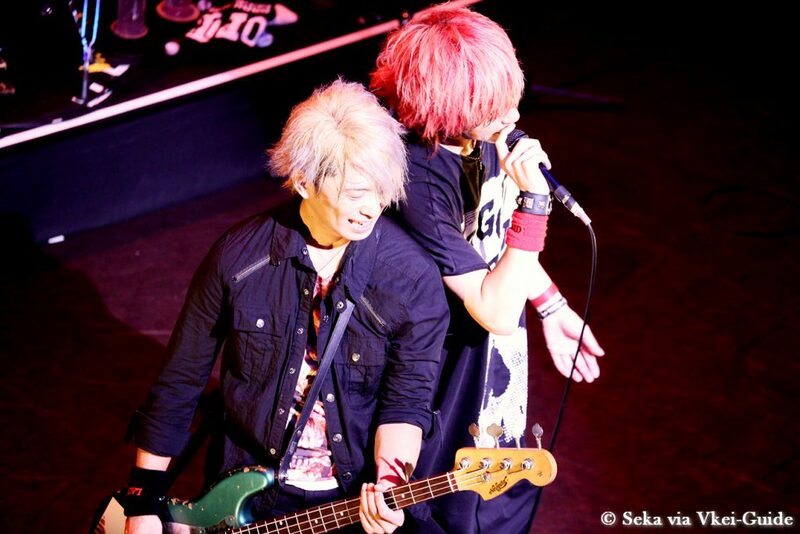 YUKI came closer to SHU and they sing along together. 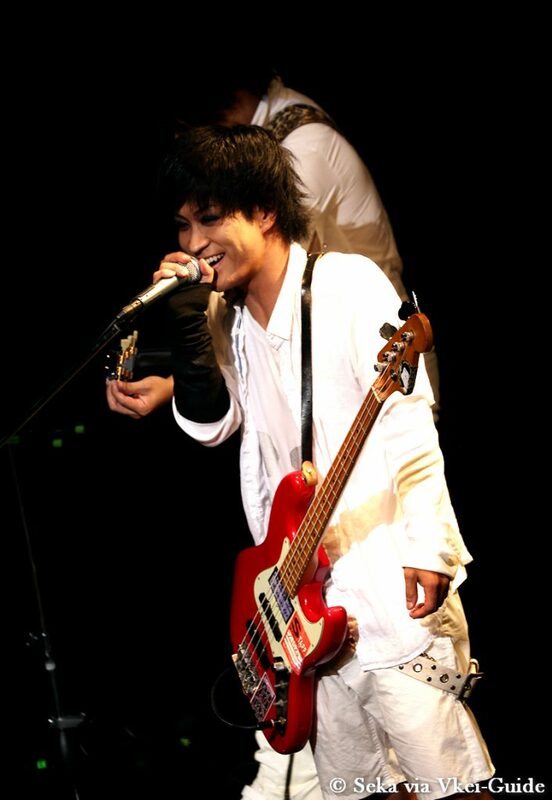 YUKI also went to the Bassist’s place Anji and both were laughing. 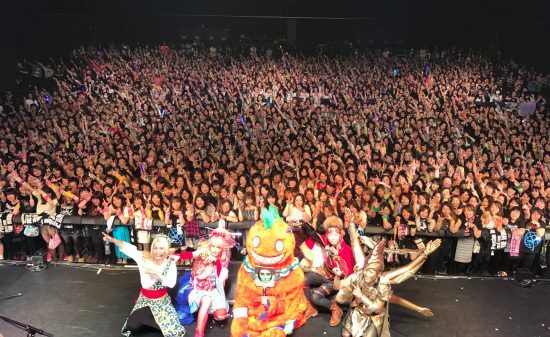 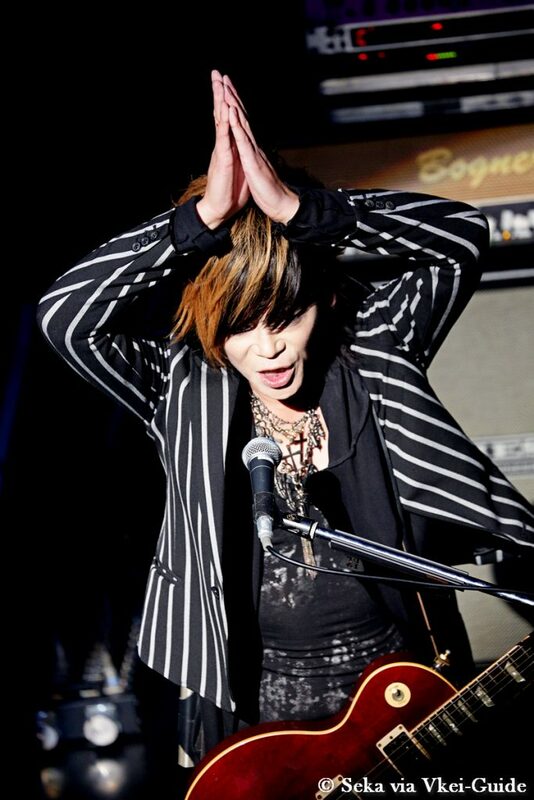 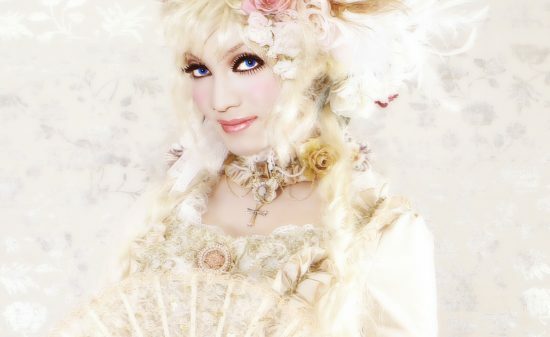 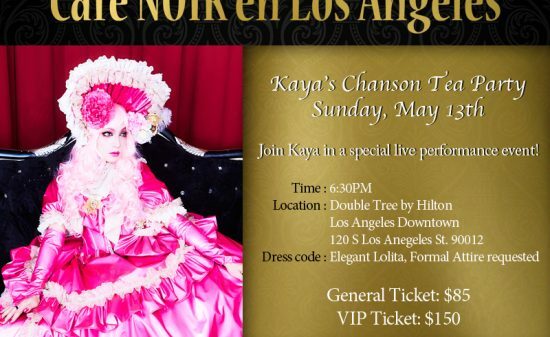 The audience holds each other’s hands and listened YUKI’s sweet voice on “Honney”. 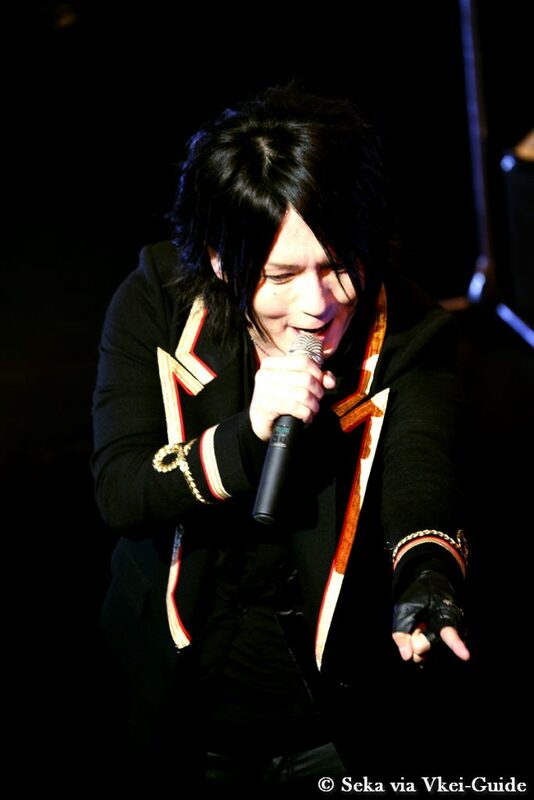 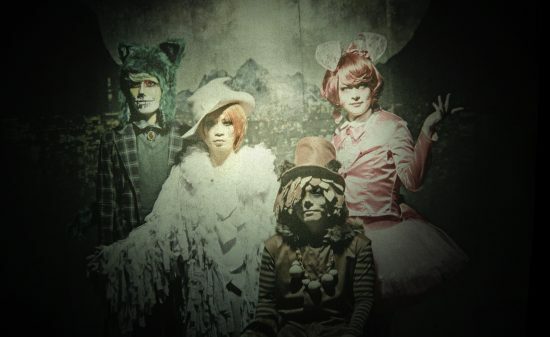 When YUKI introduced the members, Anji did his best to sing « Fuji Safari Park ». 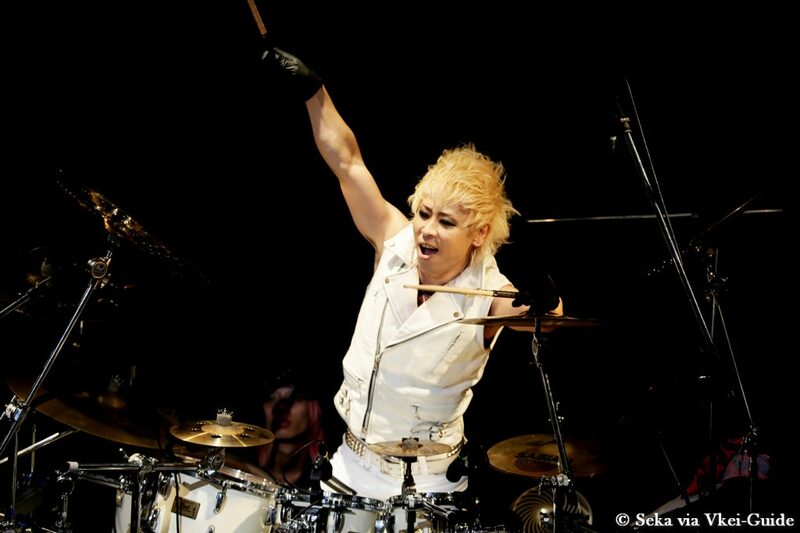 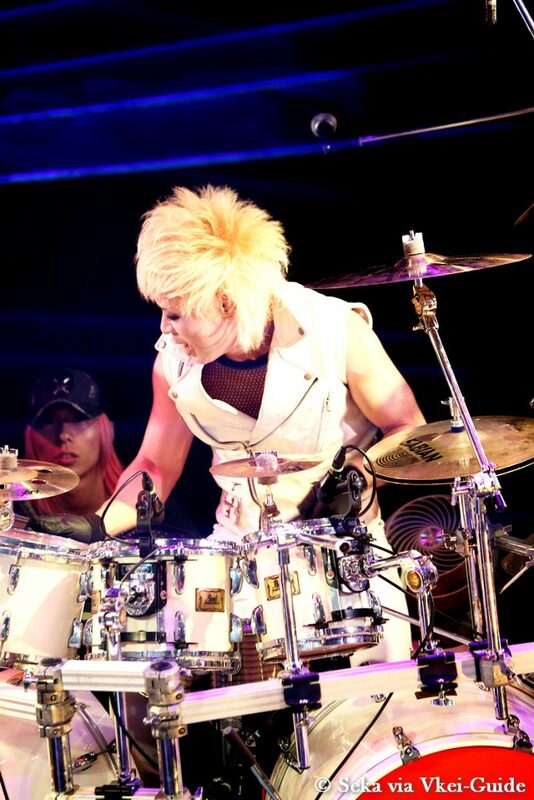 SHINGO, with such a lovely smile was beating hardly his drumset, playing very seriously. 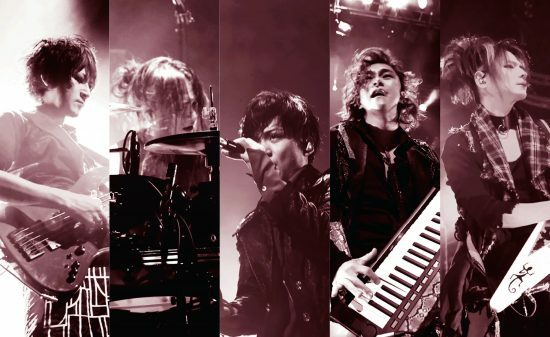 5 member’s keep their striking rhythm on their performance and gave all their heart into this live down until the last song “Go to the limit” . 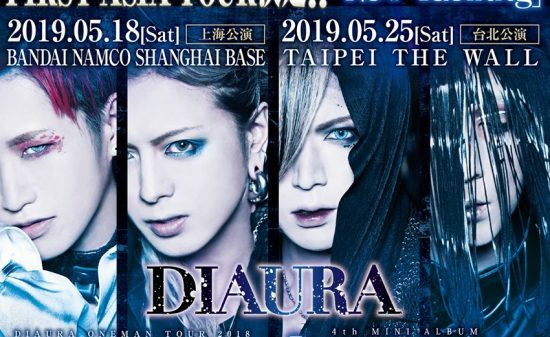 It has been already 12 years from their disband, 6 years from their reformation and even if they already went to separate way, they keep growing up all together and have things in common even now. 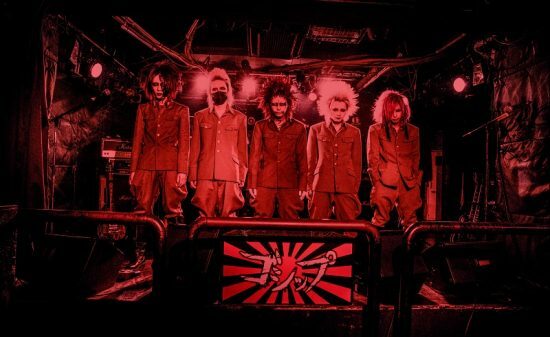 Maybe is it thanks to “Nagasaki blood”? 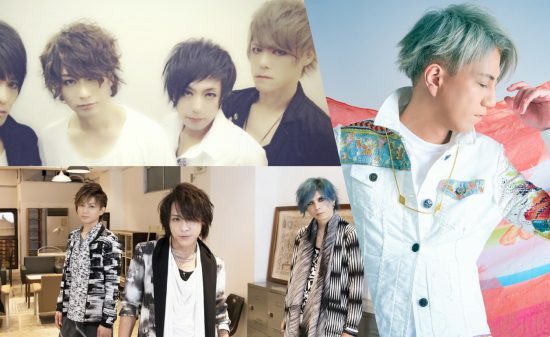 JURASSIC very talented member’s were guided by their destiny to create this band. 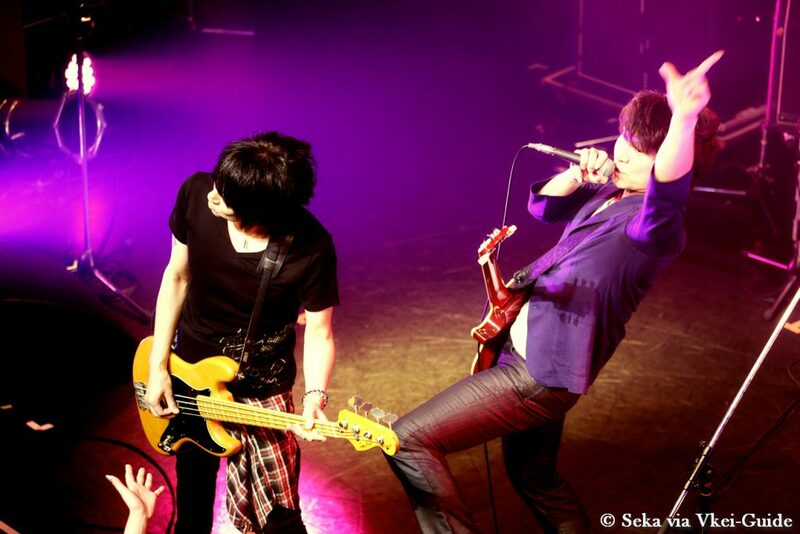 We can feel this when you see them on stage. 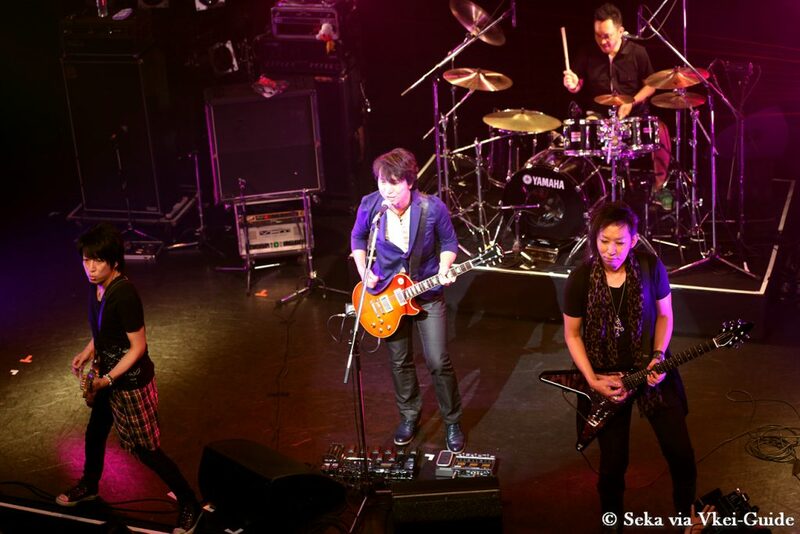 The final performer of this dream event was Dear Loving who celebrated their 23rd anniversary. 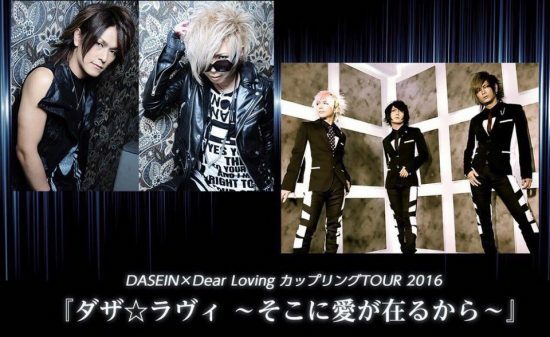 Dear Loving was the only band who never stopped their activities and are still performing on this event. 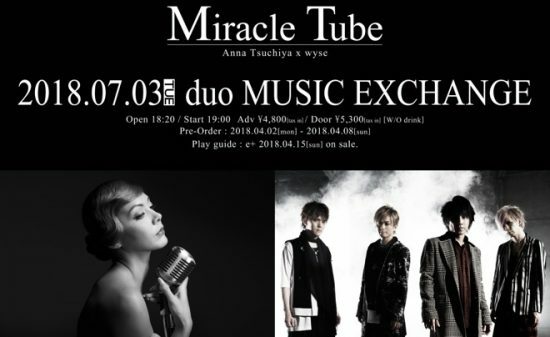 They win the whole audience’s hearts by playing“Fly high”, the first song release after their major debut, and vocalist MASA sang “I can’t love” like he did a timelaps into 90’s years. 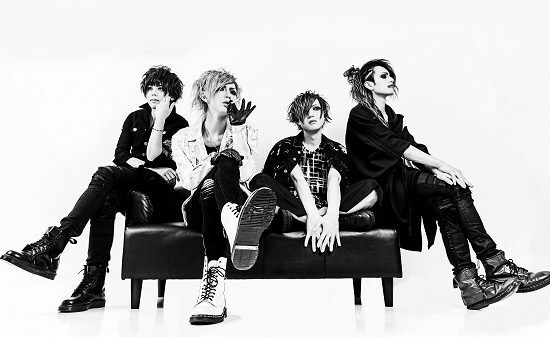 Dear Loving’s characteristic point is MASA’s voice with strong message behind their lyrics.But they played “FLASH BACK”and show off they’re very strong as a rock band. 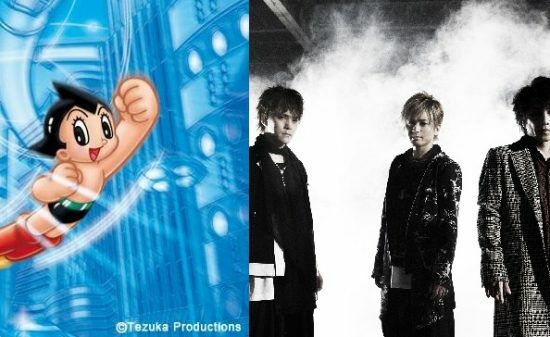 During the mc MASA just said a joke「Today’s event title is… “SHOCK WAVE~Natsu no jin” ? 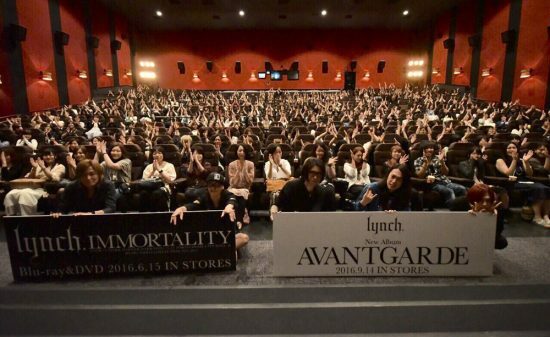 」and the audience was laughing. 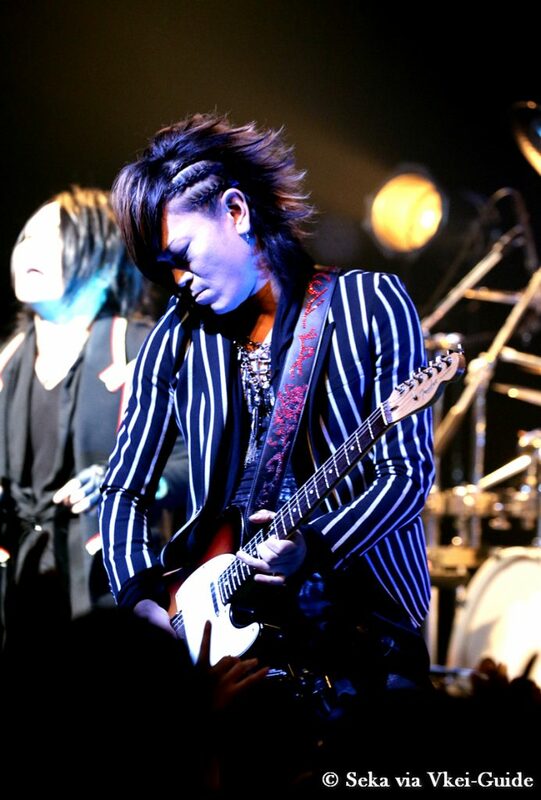 And he talk about episode that happened in the back stage, likes everybody were talking about “hairloss” or “gaining weight”. 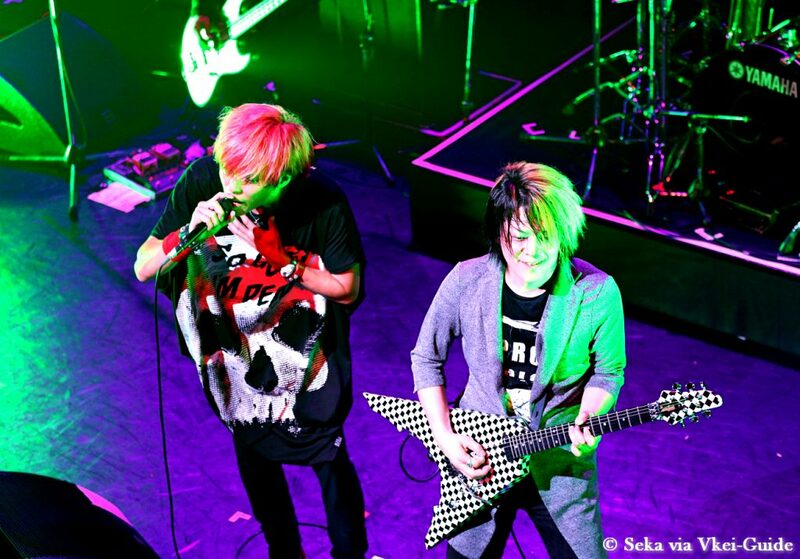 Guitalist YUKI was interacting during MASA’s talk and make the venue laugh a lots. 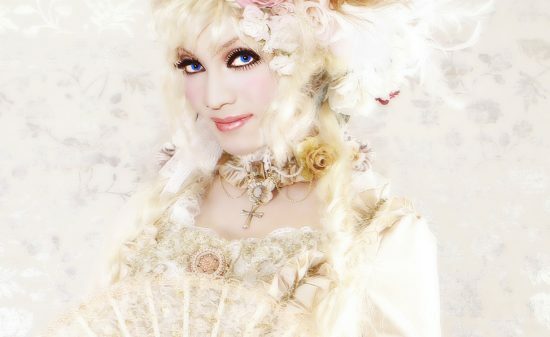 Dear Loving always create shows when you laught non stop. 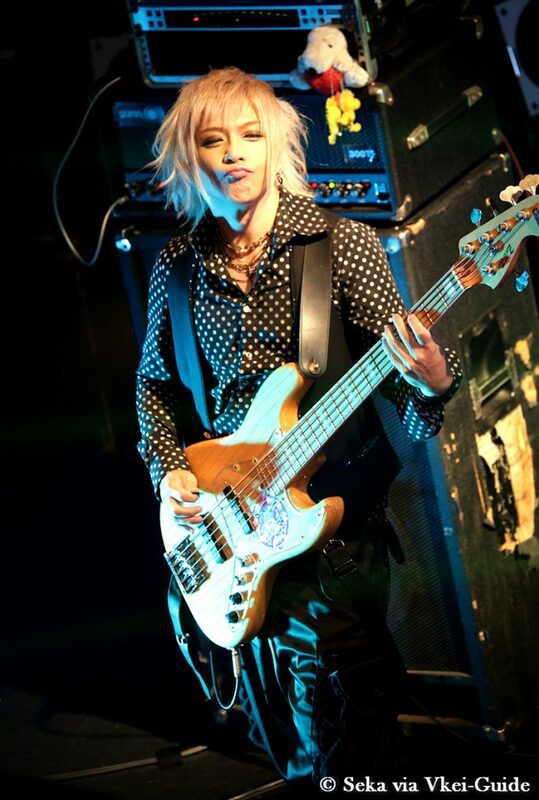 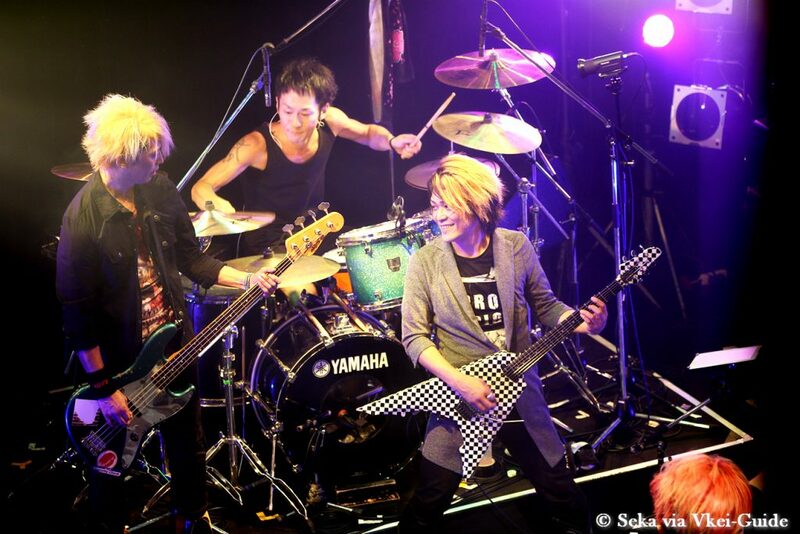 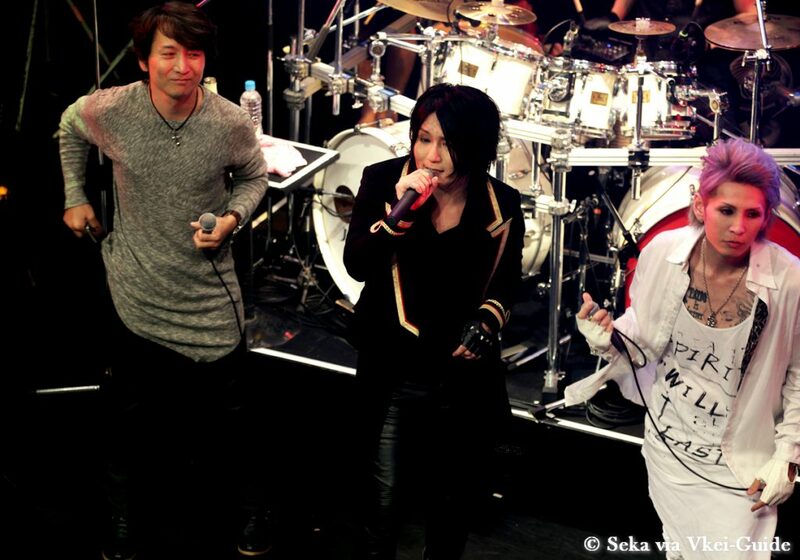 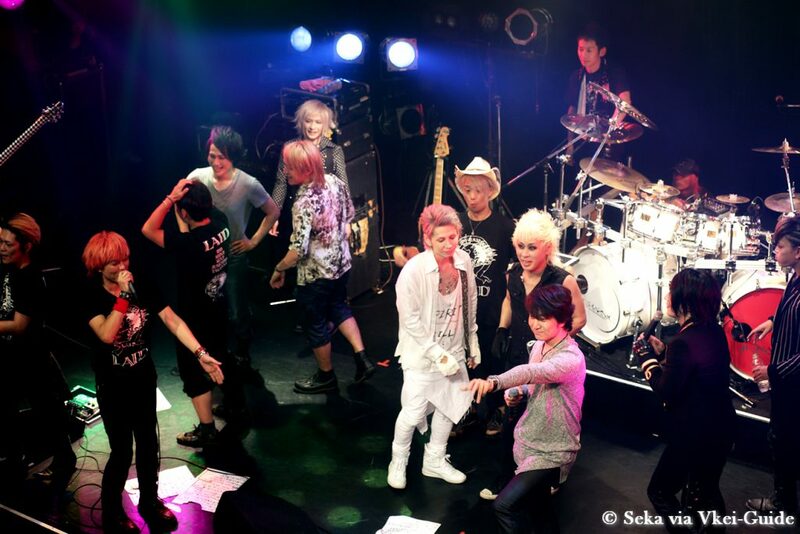 Bassist KURO kept an eye on MASA and YUKI’s talking while smiling. 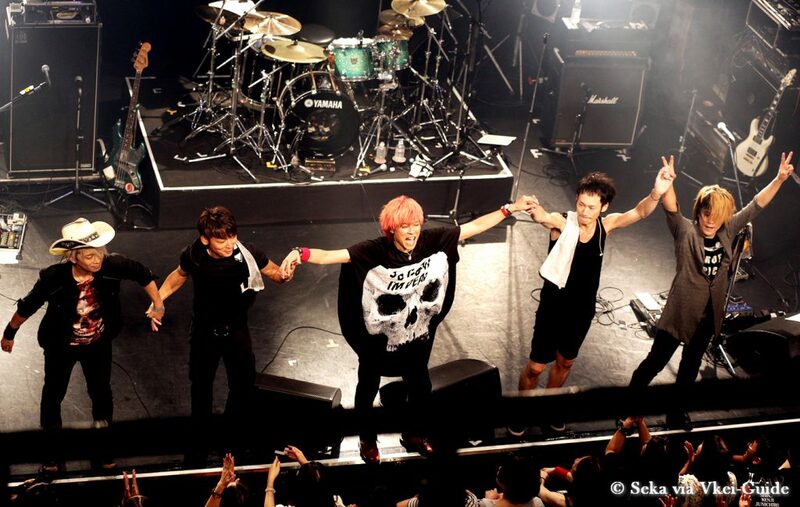 They played “DOOR” from their new album that was released on Aug 10th, and catched their fan’s heart. 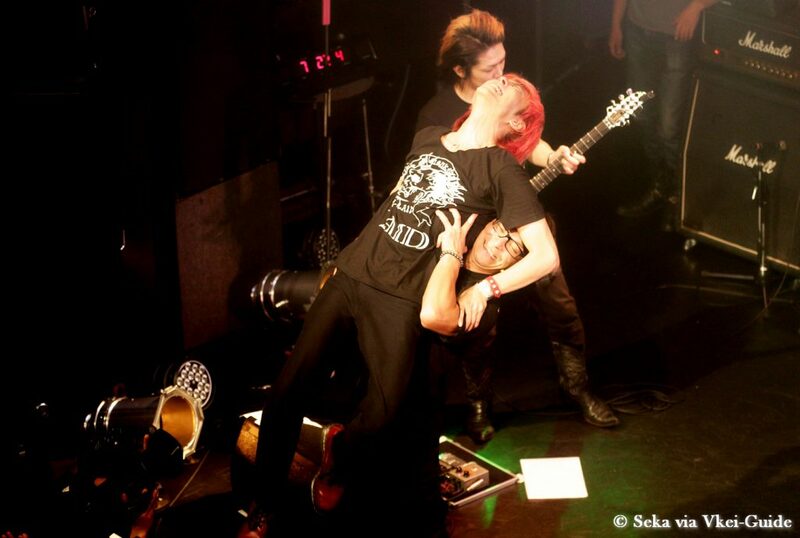 After YUKI proclaimed himself as“the funniest guitarist in Japan”and so on did some gag and made the whole livehouse turn into laughs. 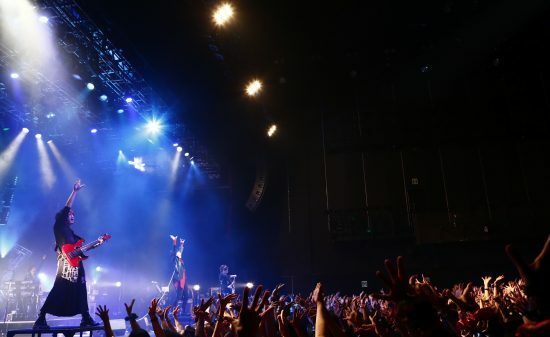 They played rock songs “I’m here” from their new album, then the basic song at their live show “CLIMBER” , “LOVE ME”and they sent message to the audience. 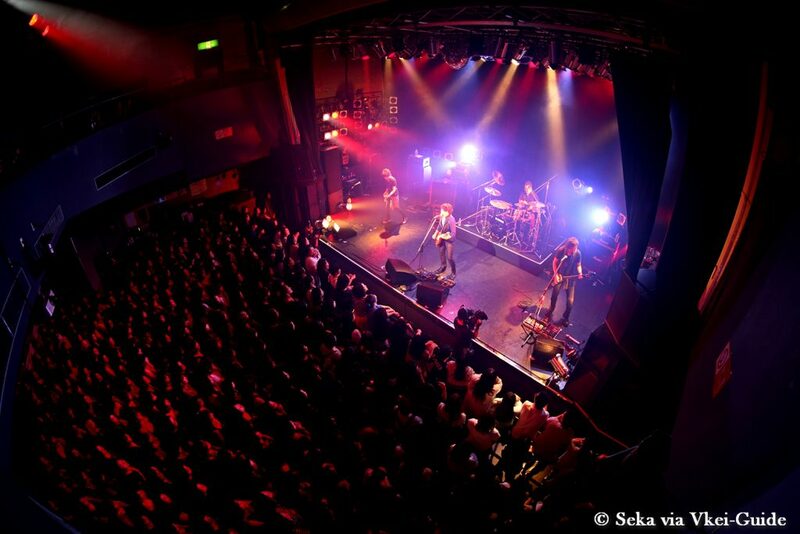 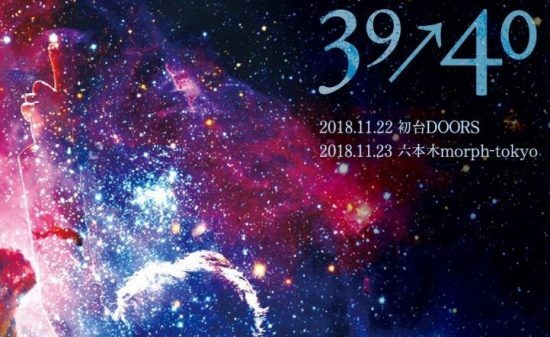 At last song “365” , MASA sang “Nobody supporting part in each life” and celeblated this event with all people in here. 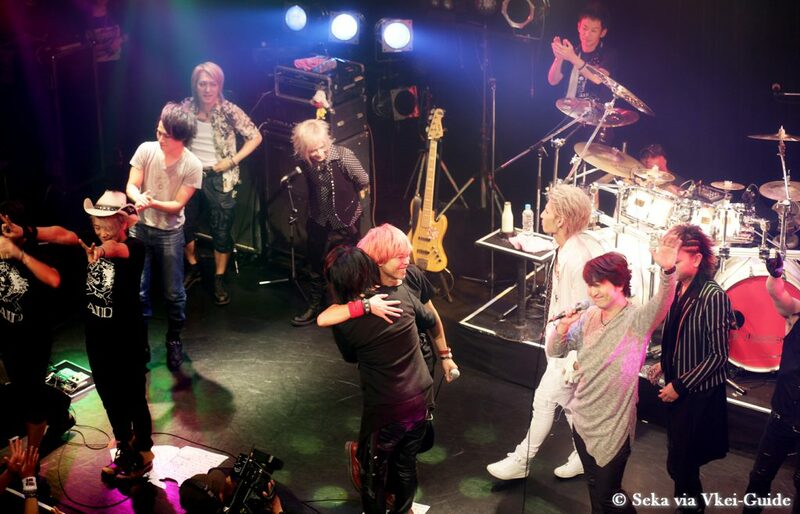 All bands came back on stage for an encore’s session and decided to sing the symbolic “Melty Love” from SHAZNA. 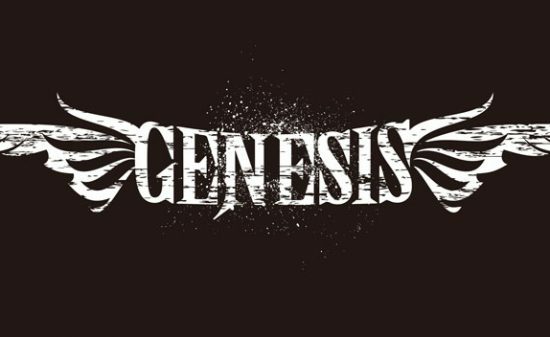 This song was very famous and marked their generation. 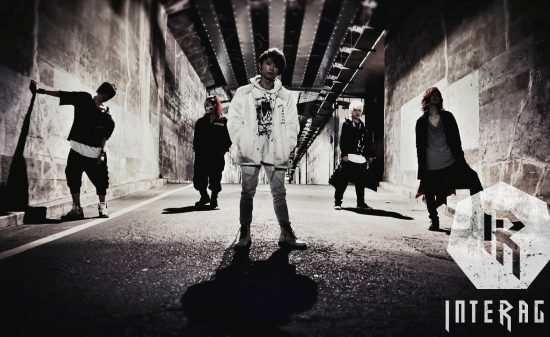 Everybody wanted to have a major debut and follow their dream to reach success. 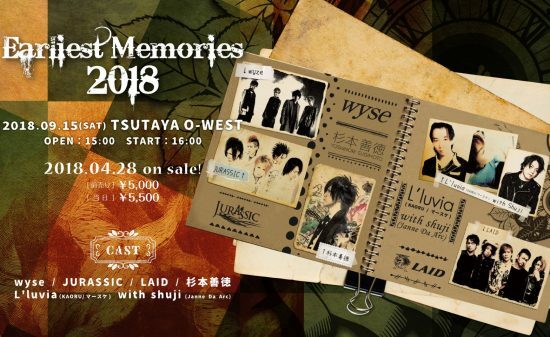 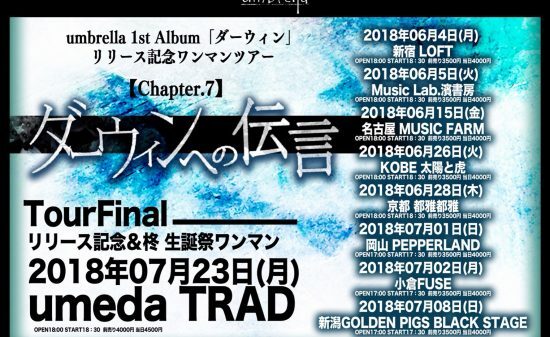 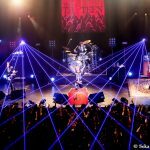 On Aug 7th, 2016 the members from the bands who gather at TSUTAYA O-WEST in Shibuya, were all from the “WEST part” in Japan.This venue might had been a bit small for this event, but the choice of this livehouse definitely had a special meaning. 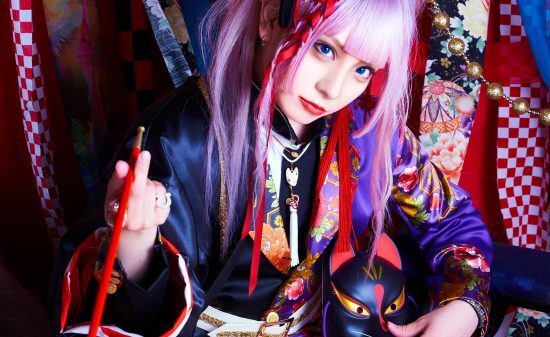 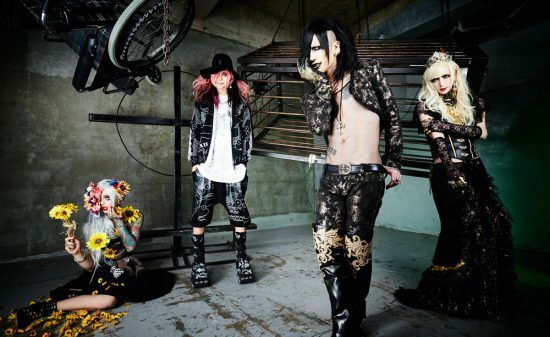 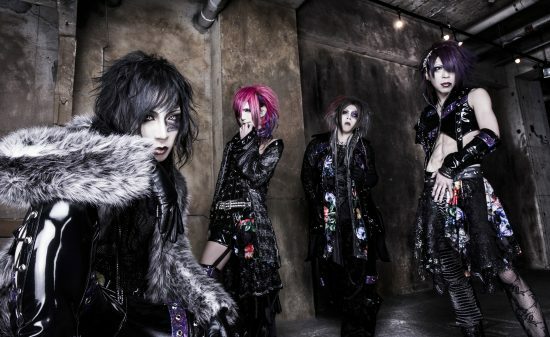 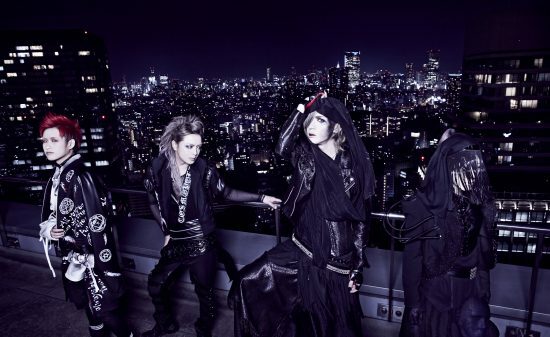 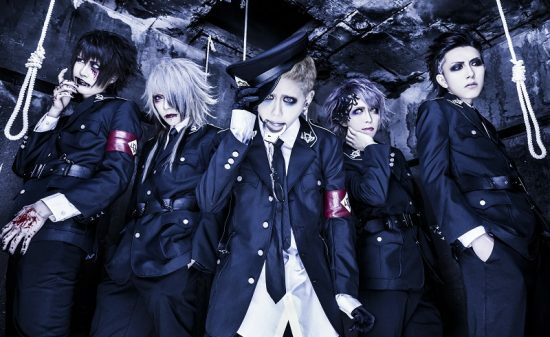 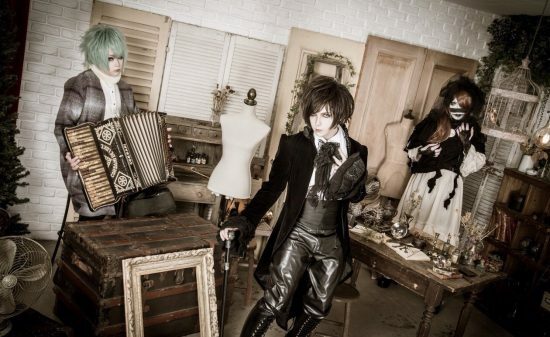 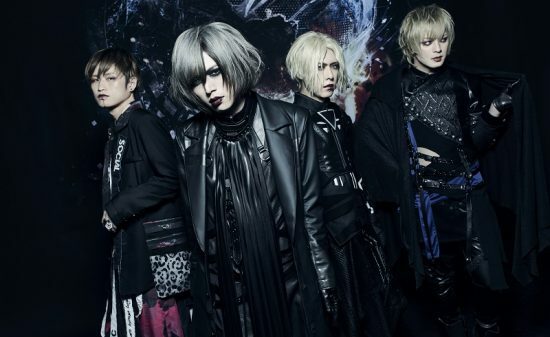 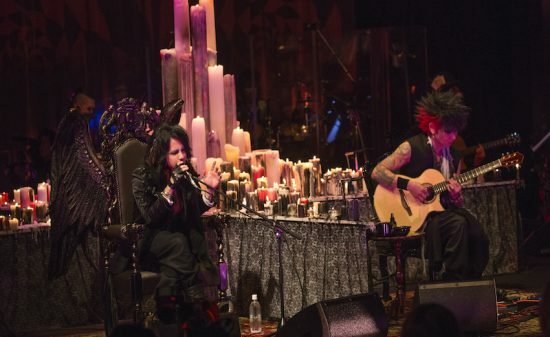 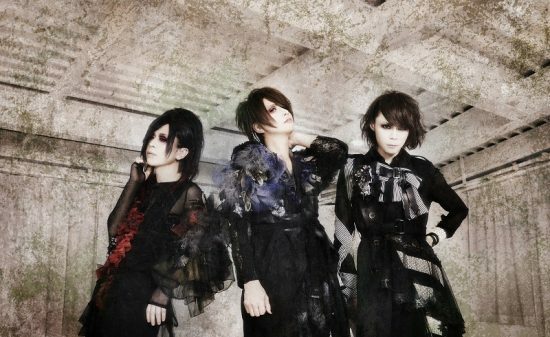 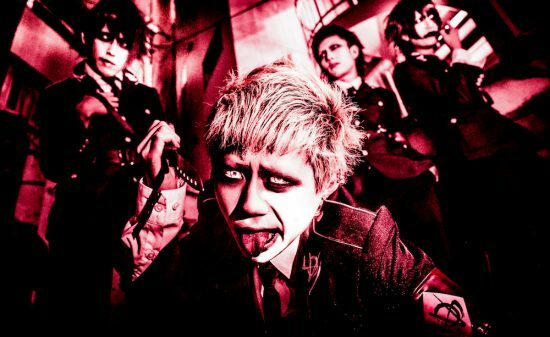 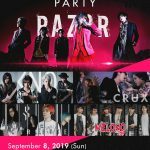 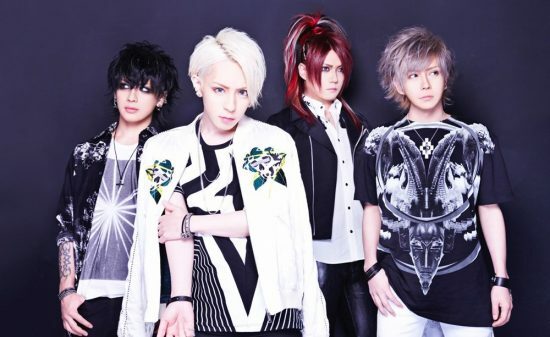 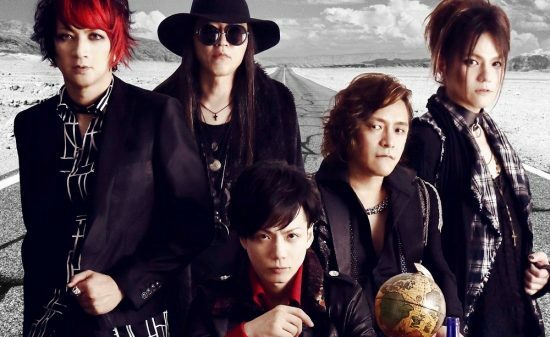 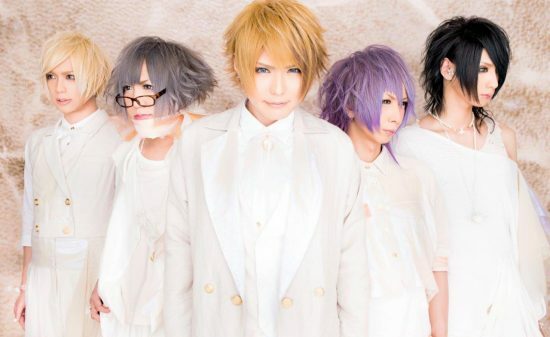 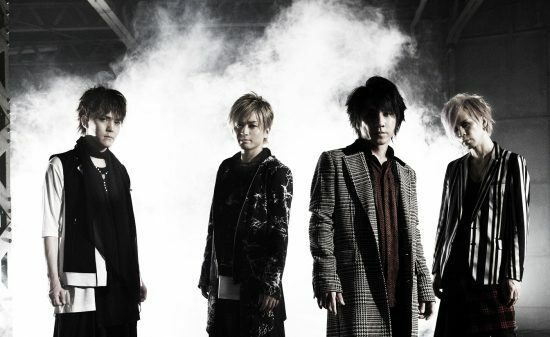 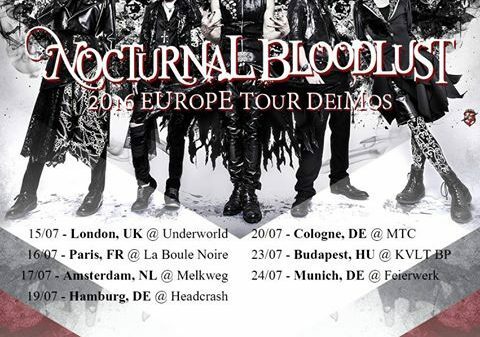 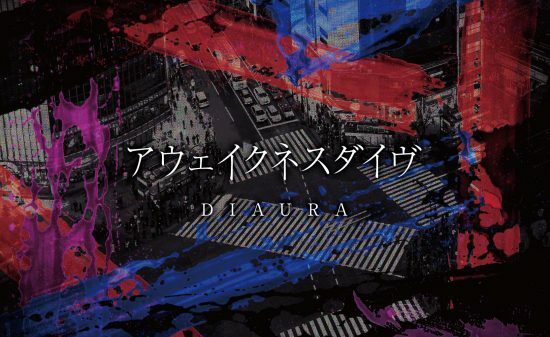 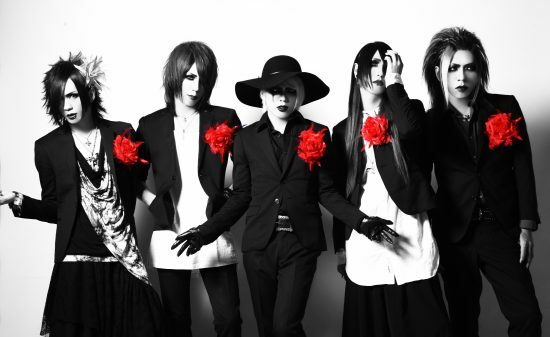 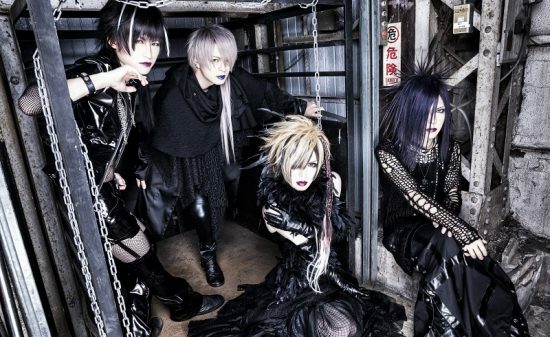 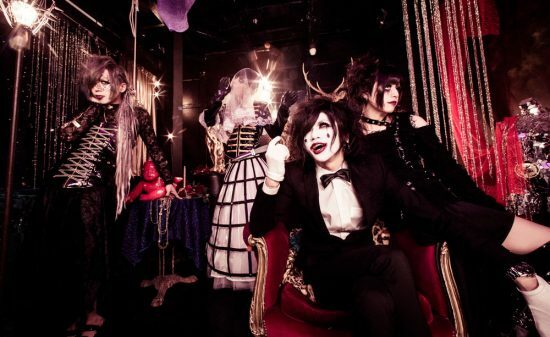 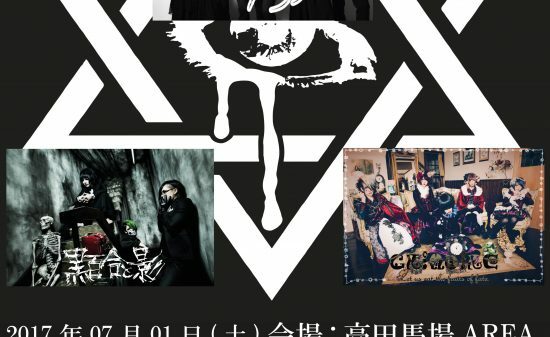 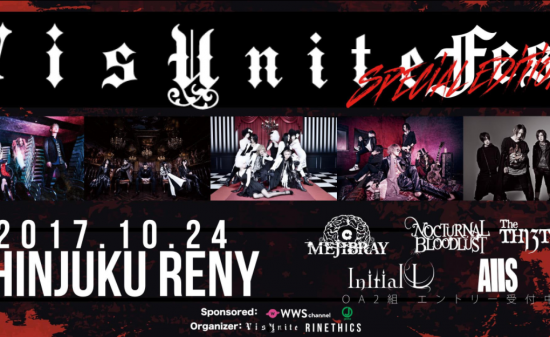 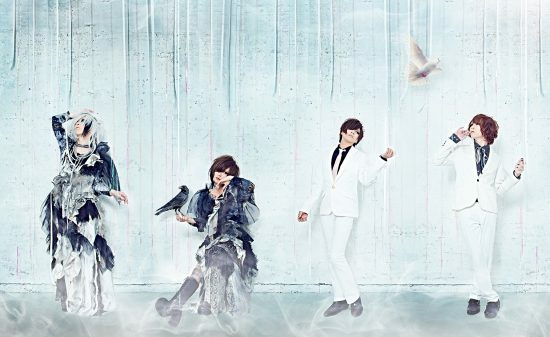 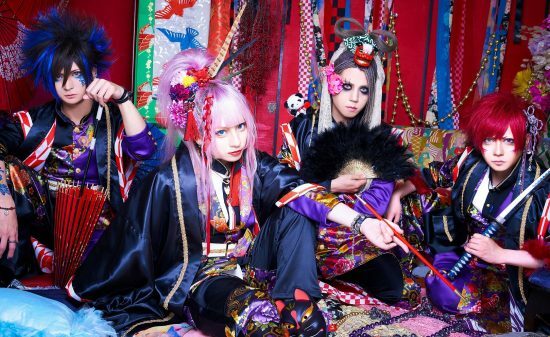 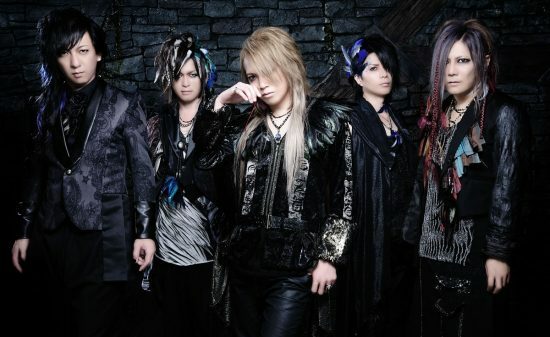 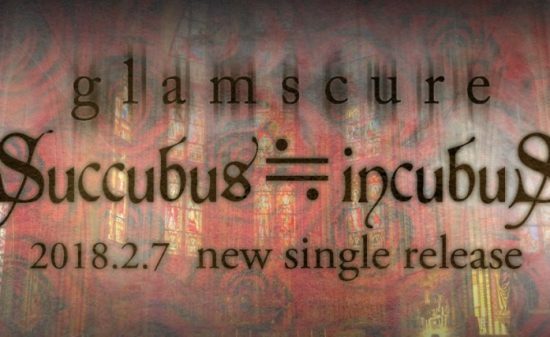 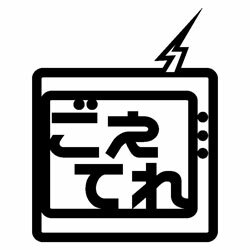 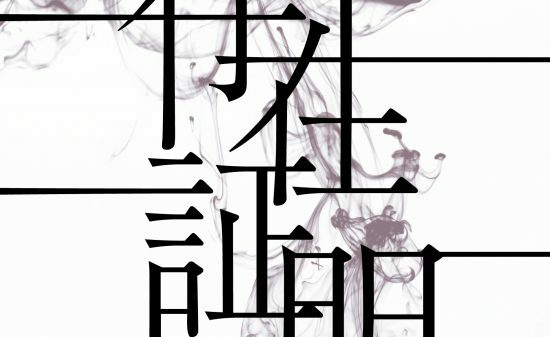 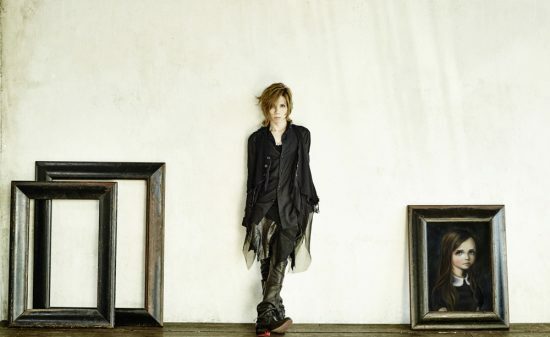 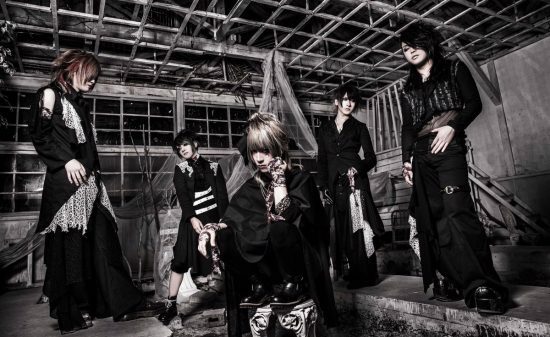 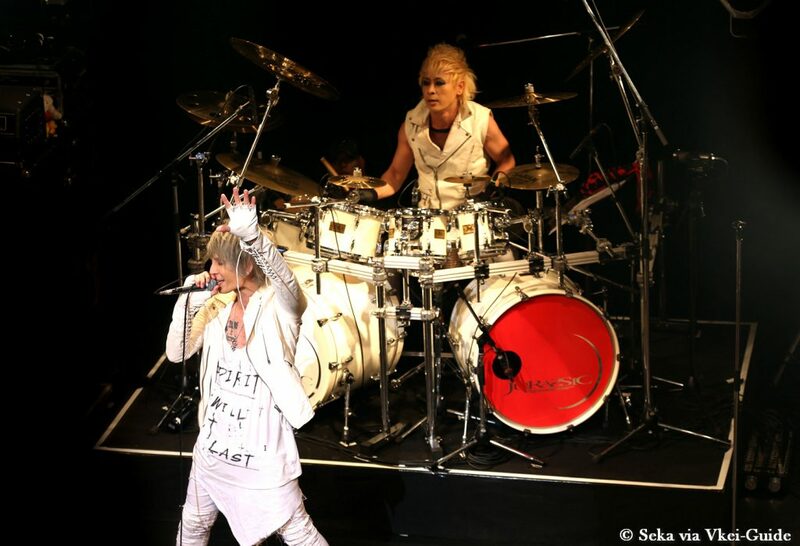 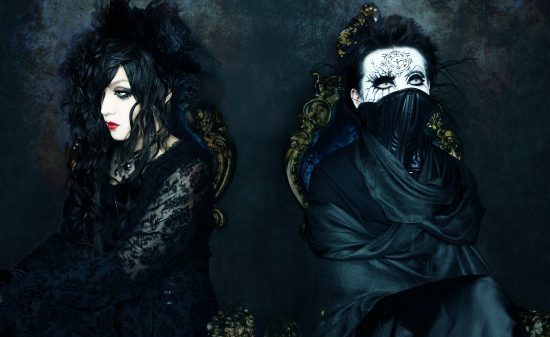 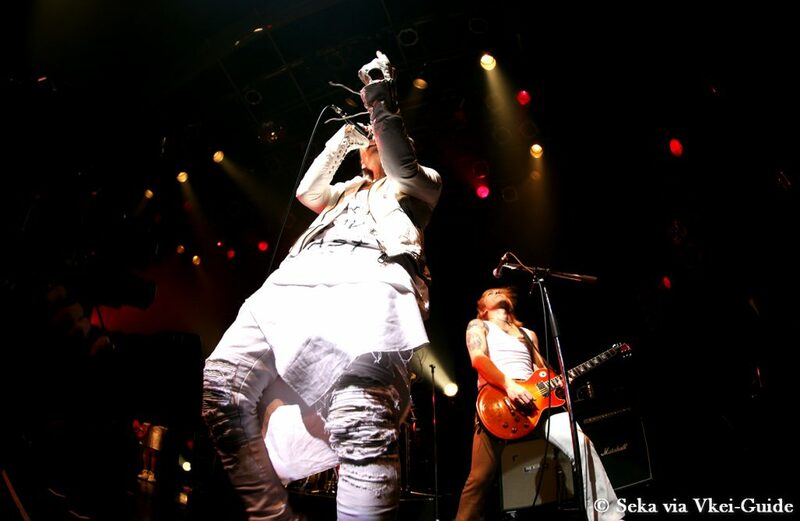 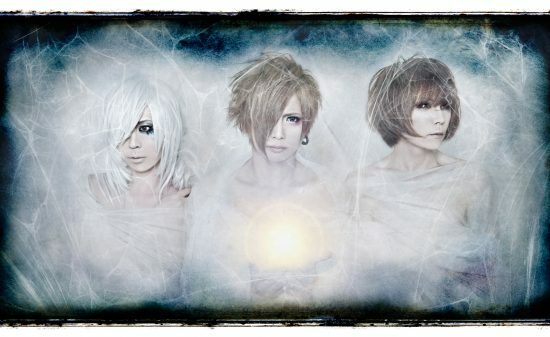 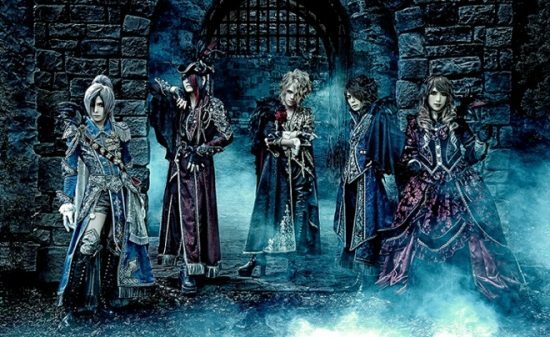 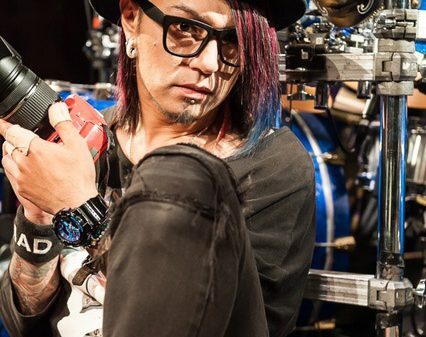 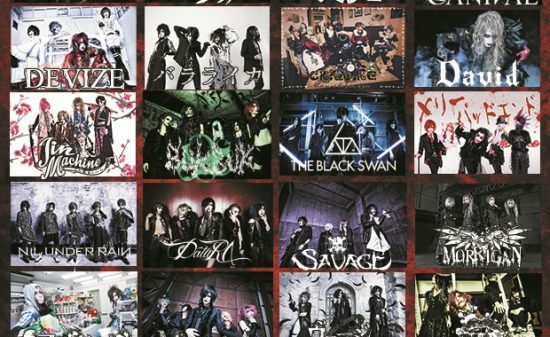 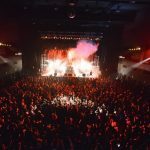 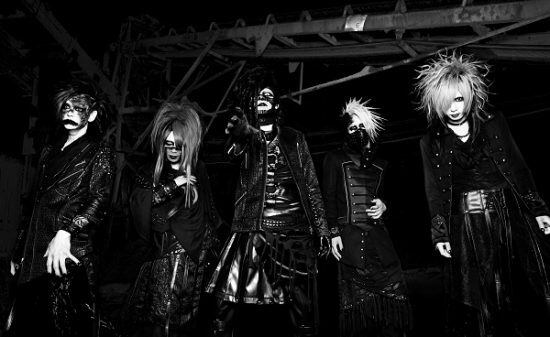 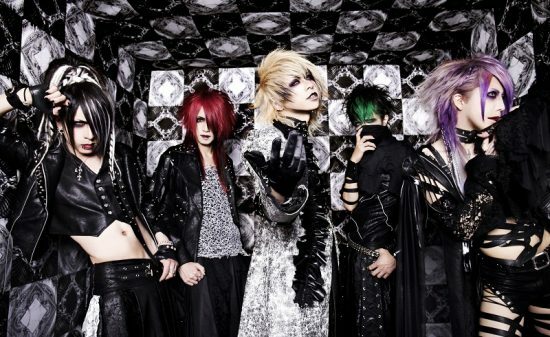 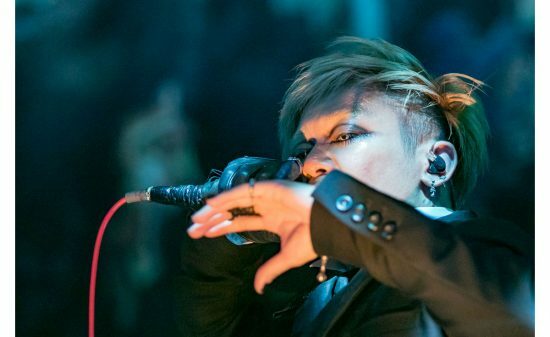 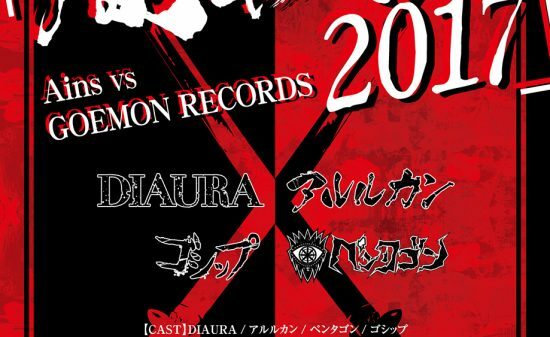 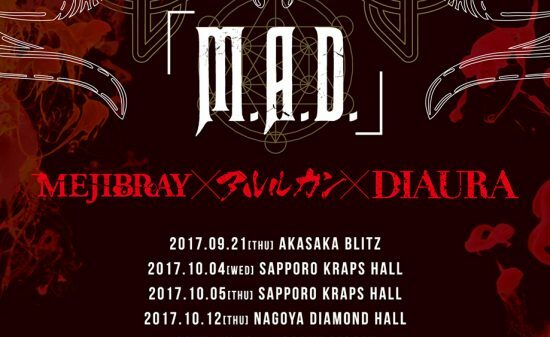 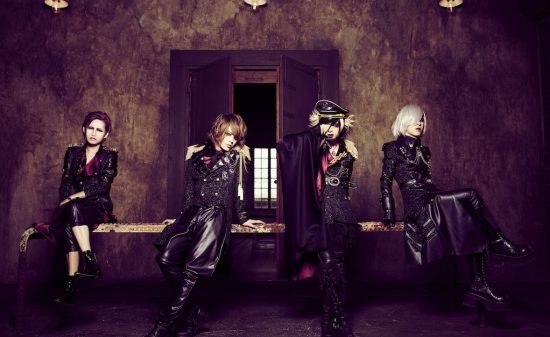 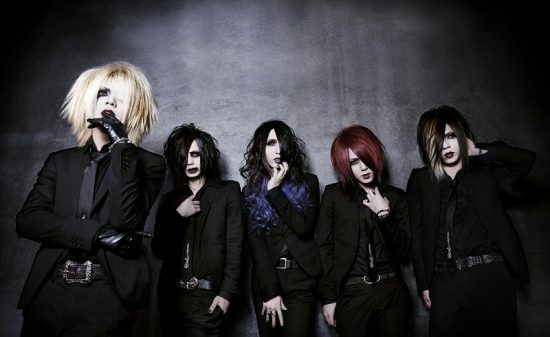 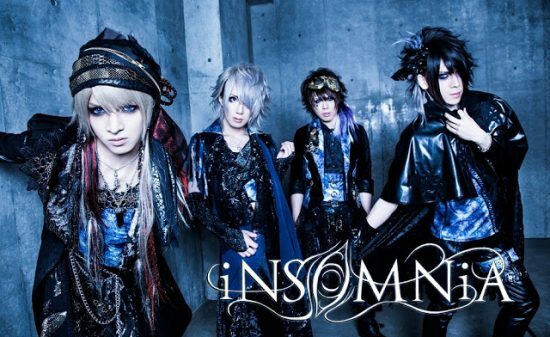 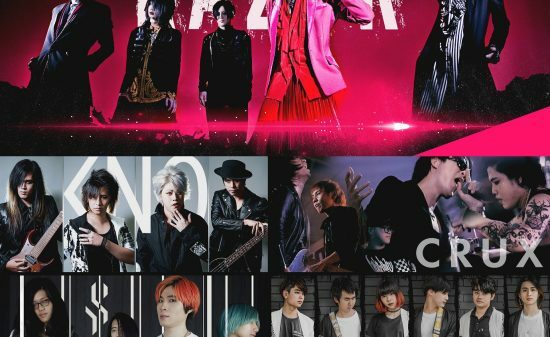 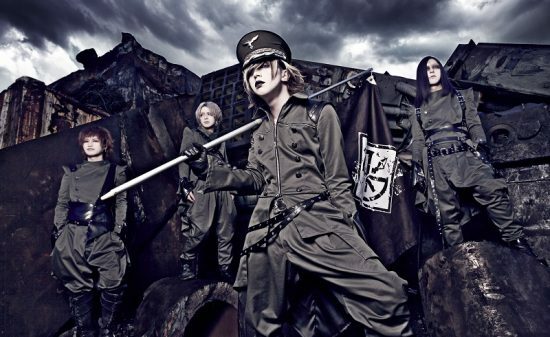 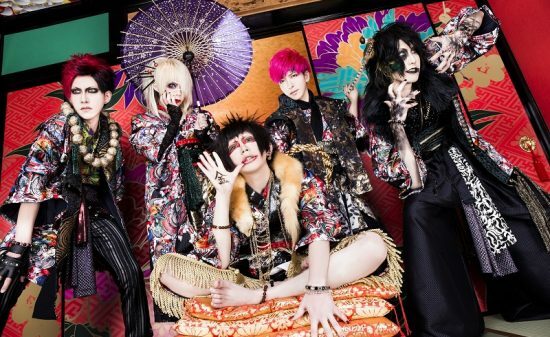 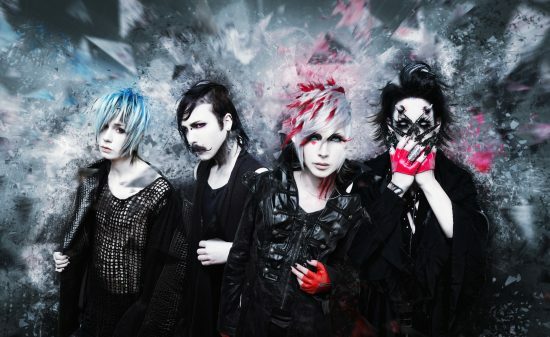 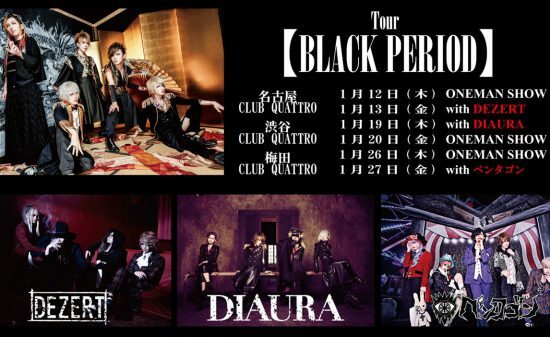 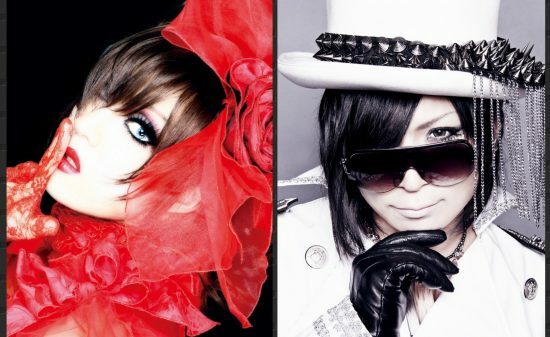 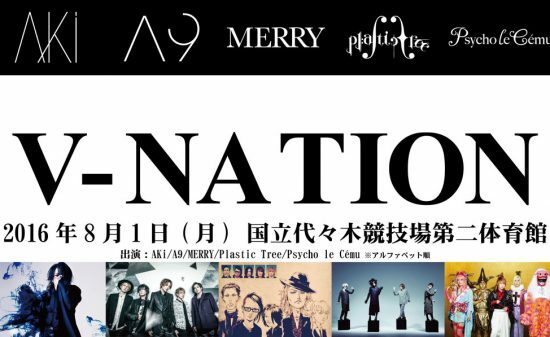 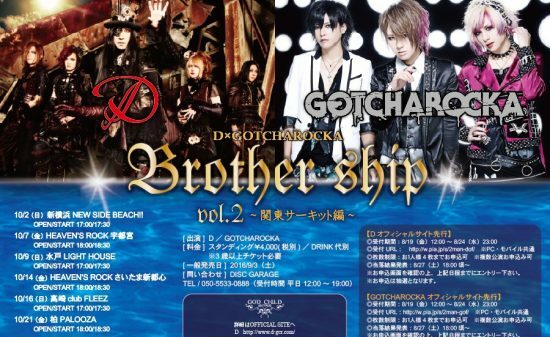 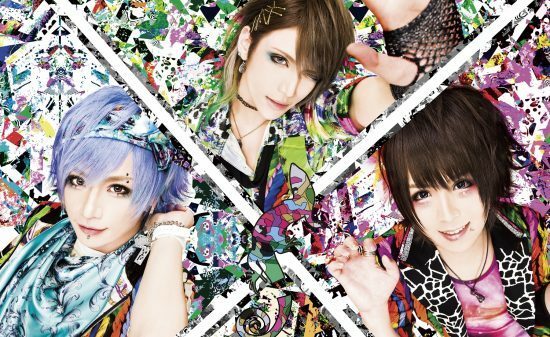 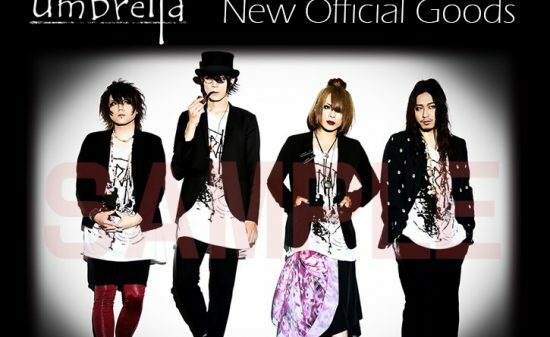 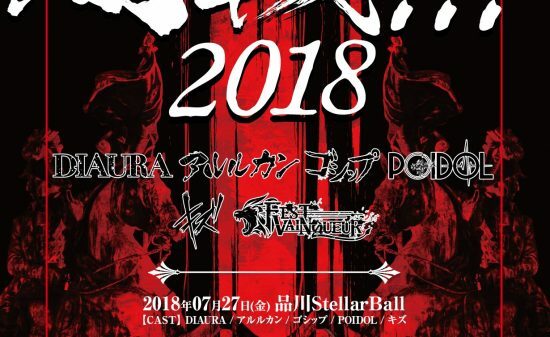 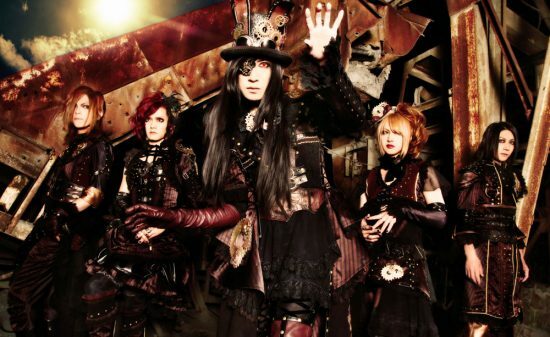 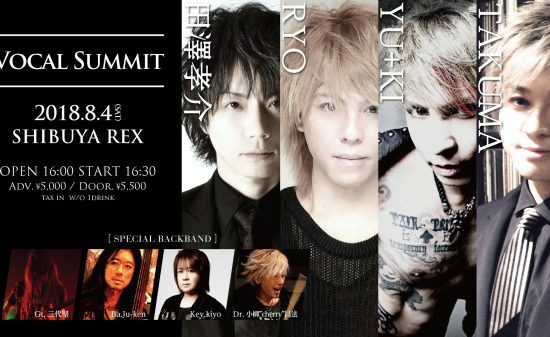 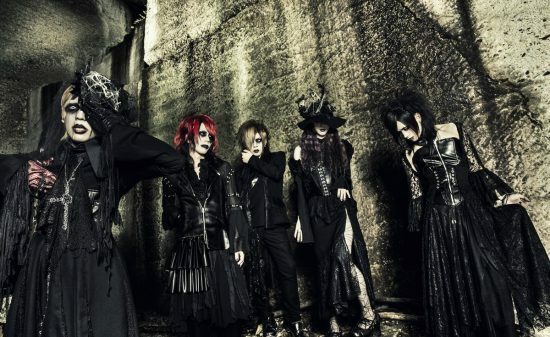 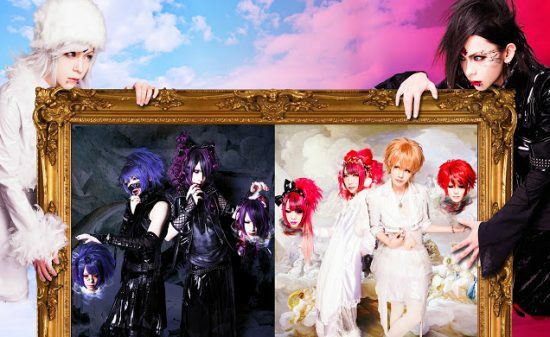 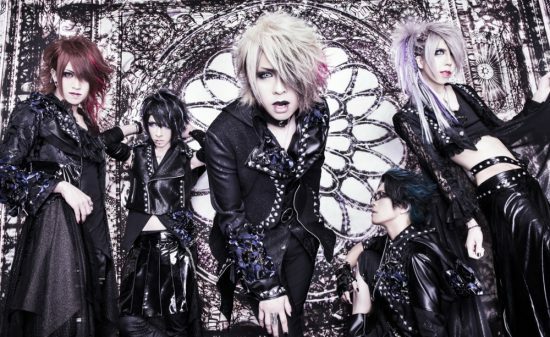 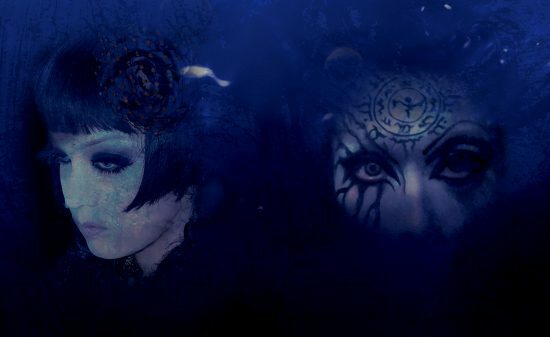 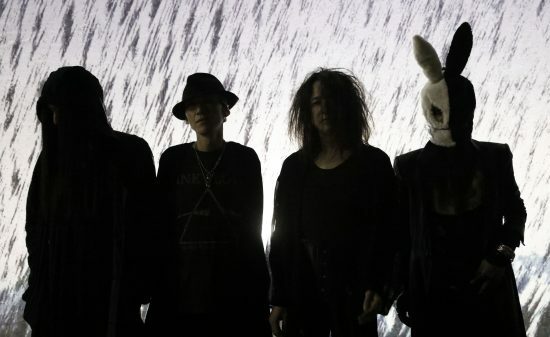 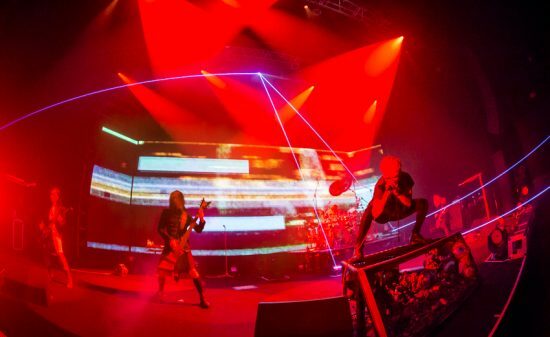 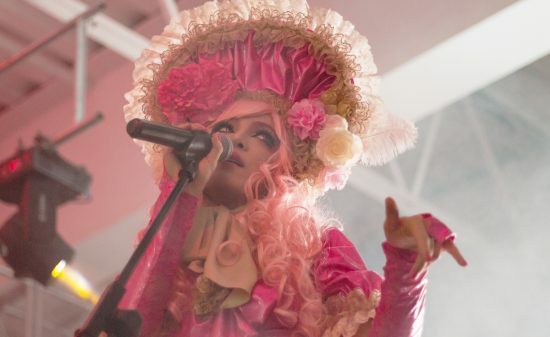 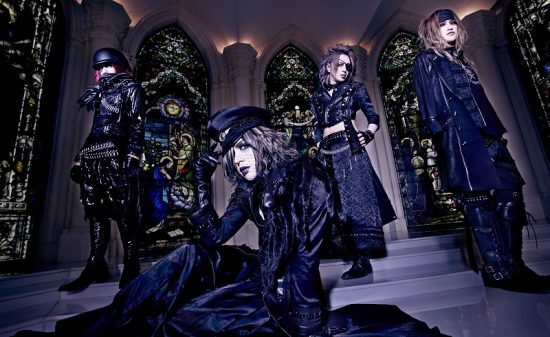 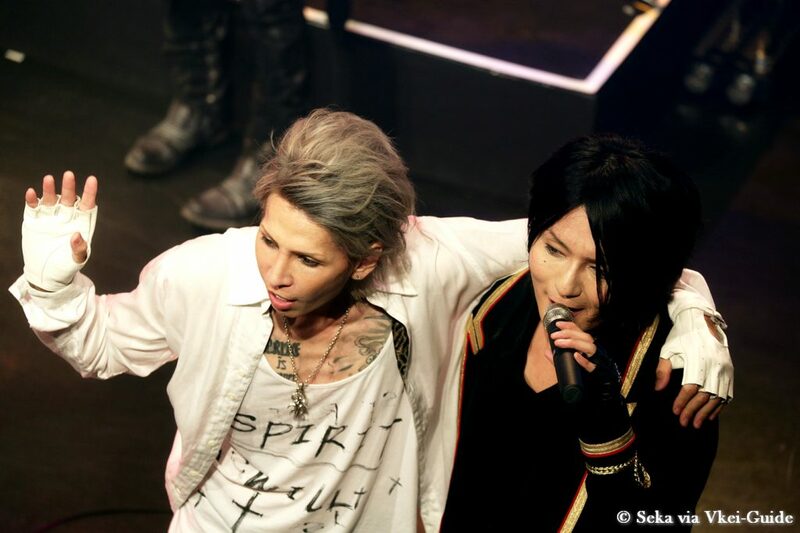 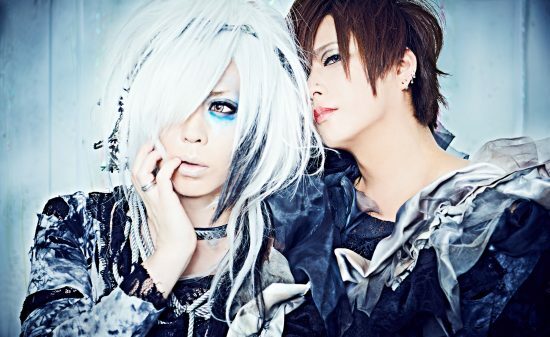 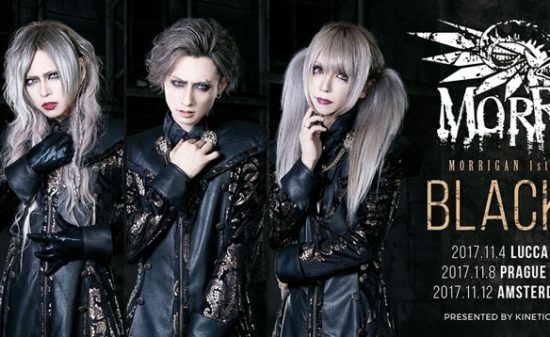 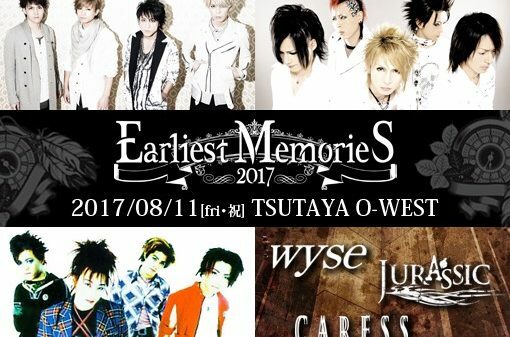 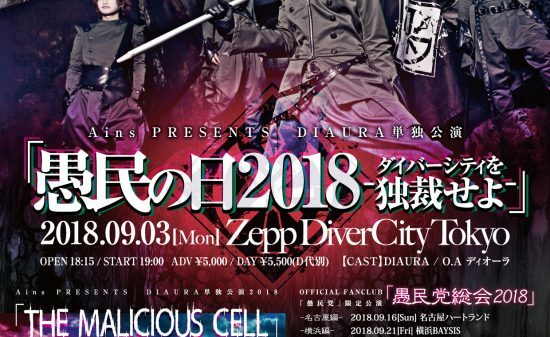 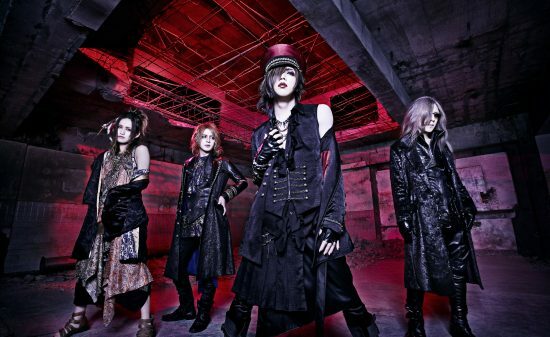 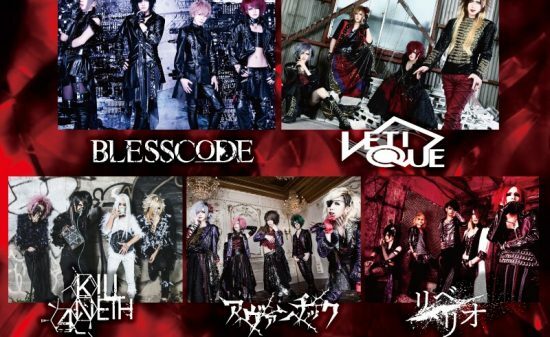 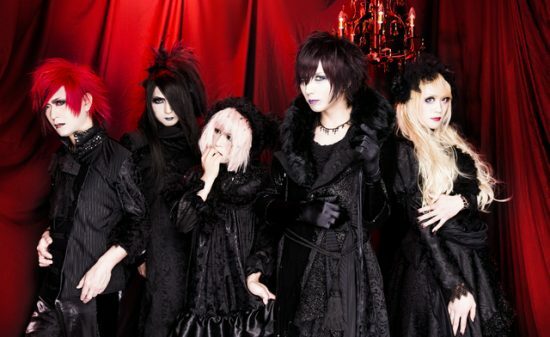 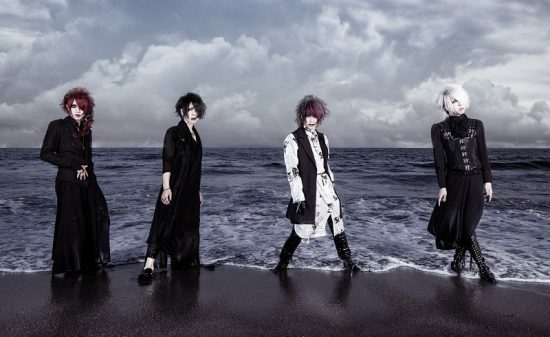 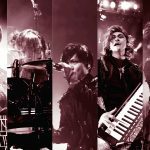 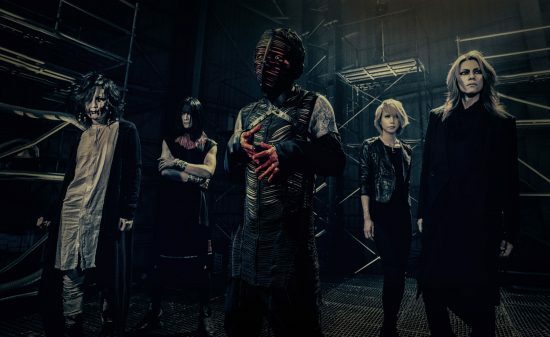 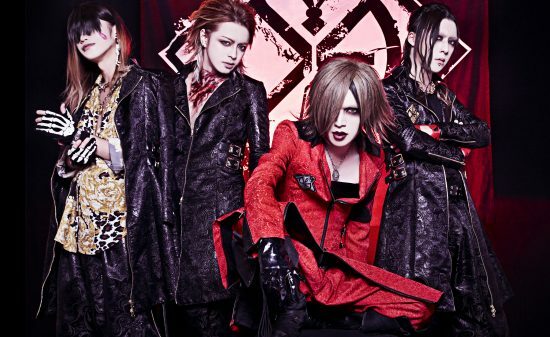 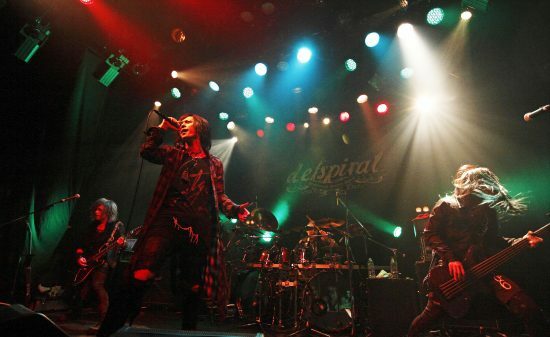 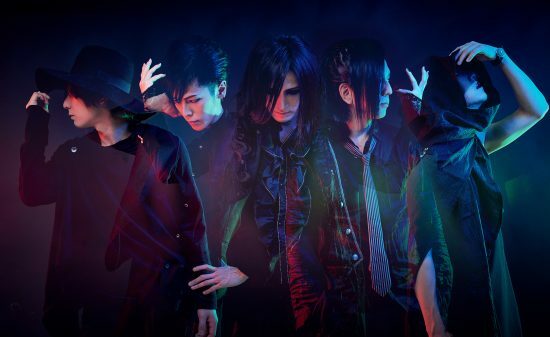 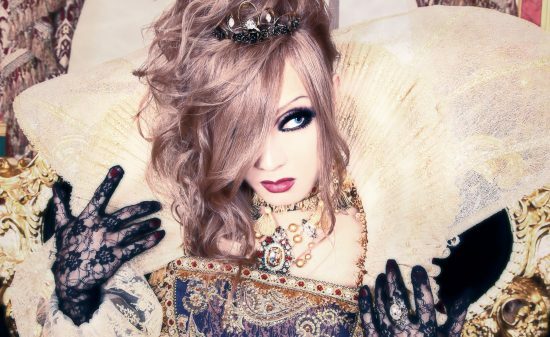 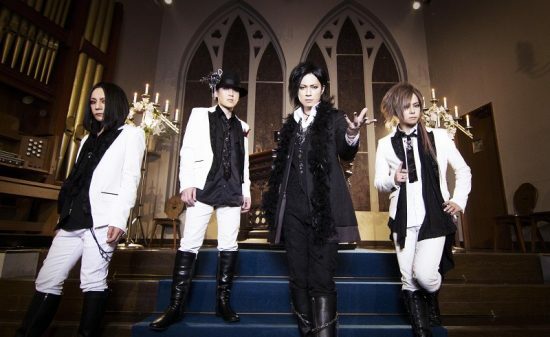 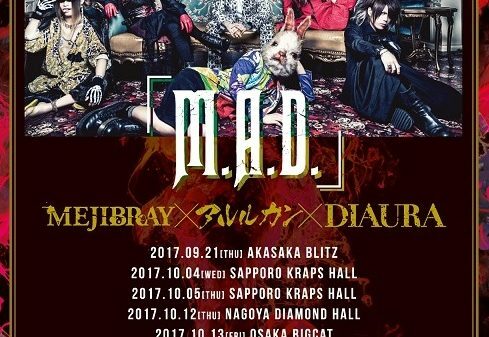 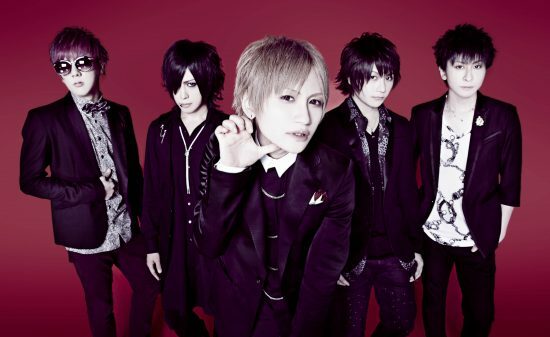 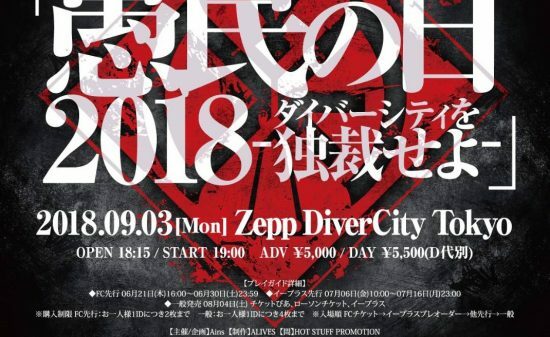 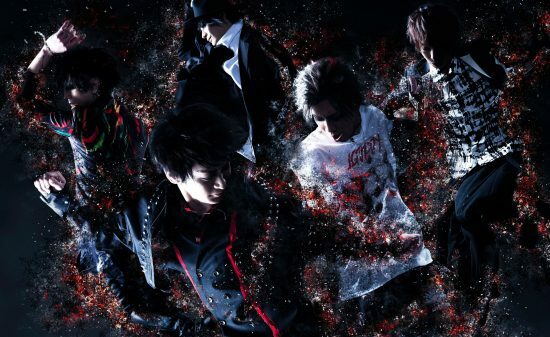 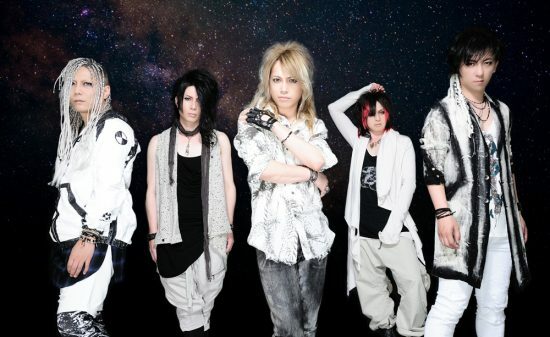 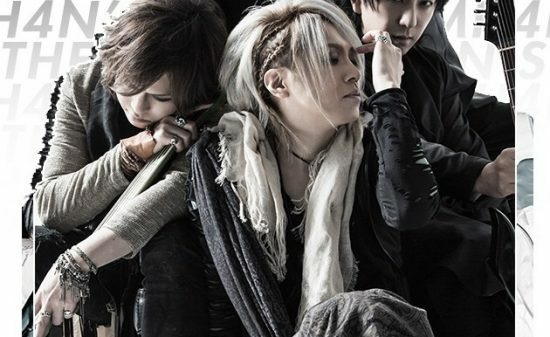 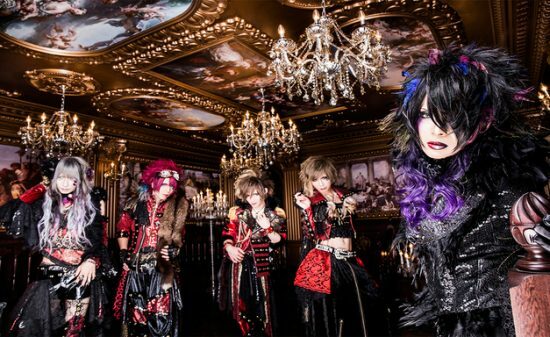 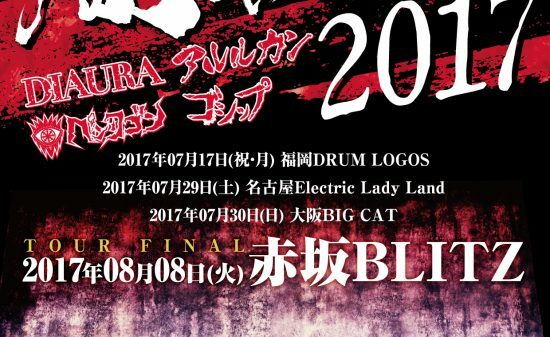 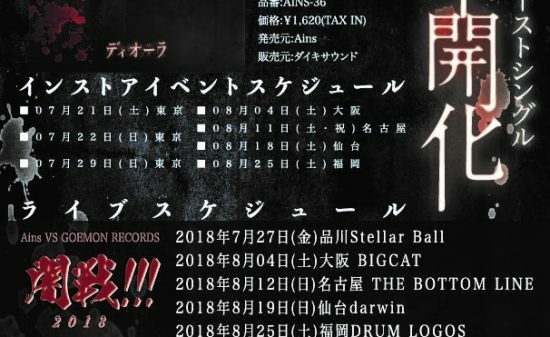 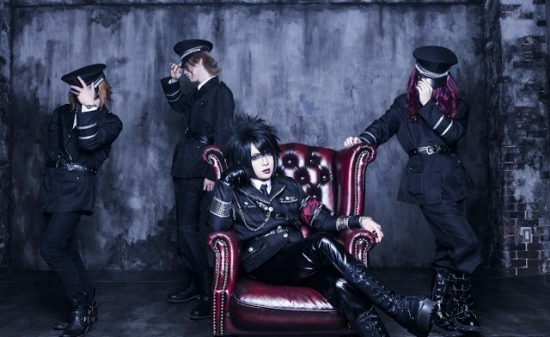 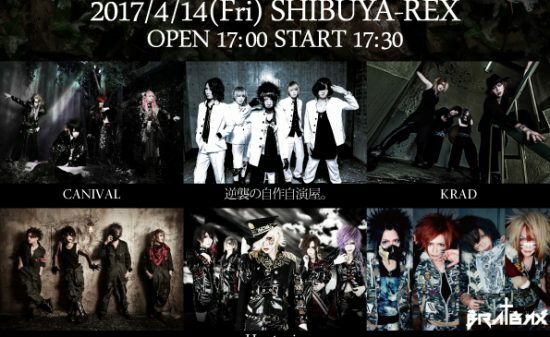 the theme of “Earliest Memories” was to “reform in order to go back on stage” .Even if on this event we saw bands come back from their past activities it also marked a step for a new history in Visual-kei scene. 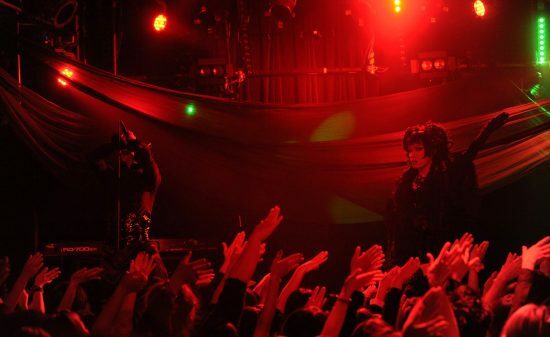 Plus another theme was the birthday event for Mr.YTK who is the producer. 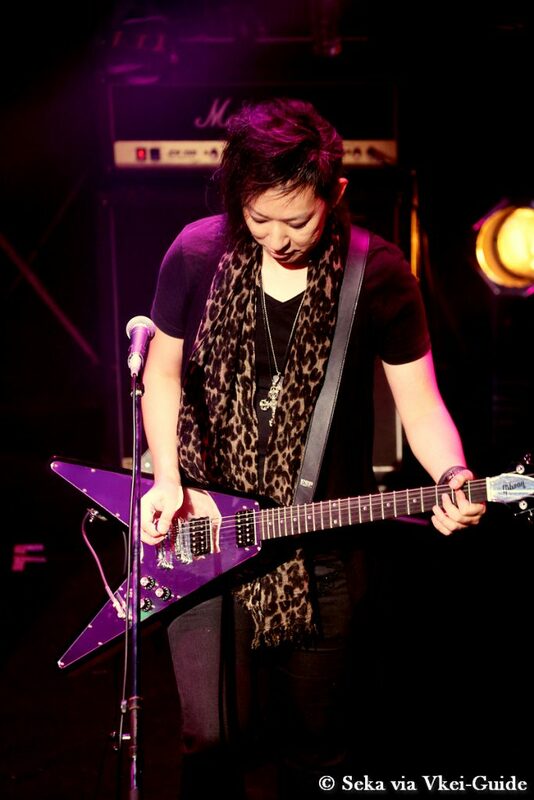 Mr.YTK keep his identity secret from everyone, however you should better check his event in the near future because he’s very talented for making great events in order to make happy fans and also artists.